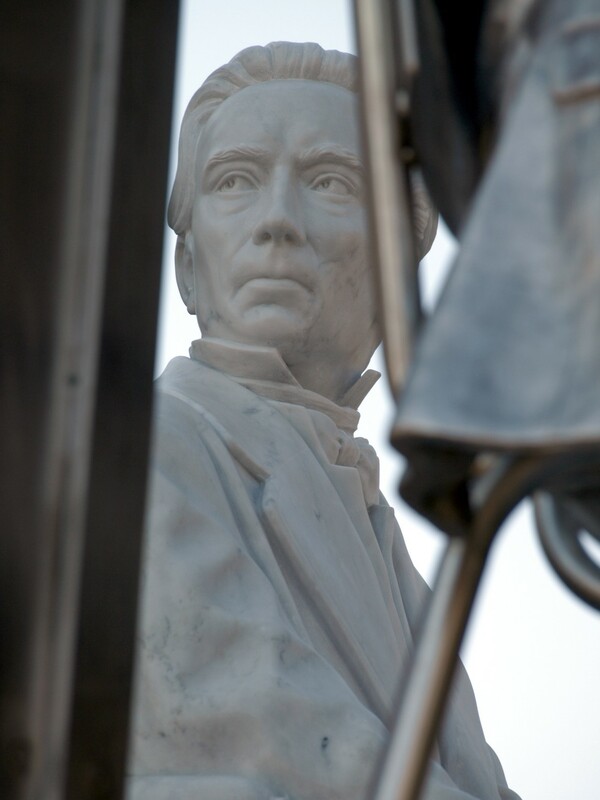 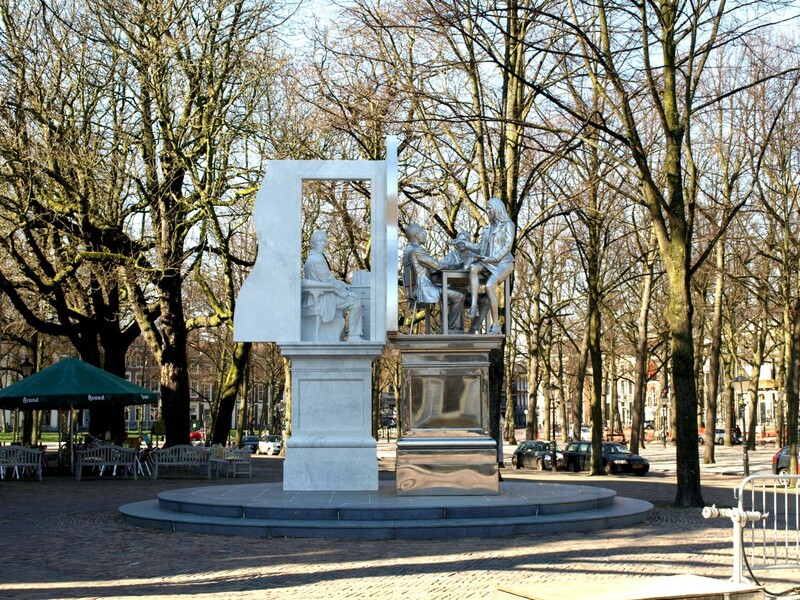 I went to Lange Voorhout to see Thom Puckey’s new Monument for Johan Rudolph Thorbecke and to write a review about it for Villa La Repubblica. 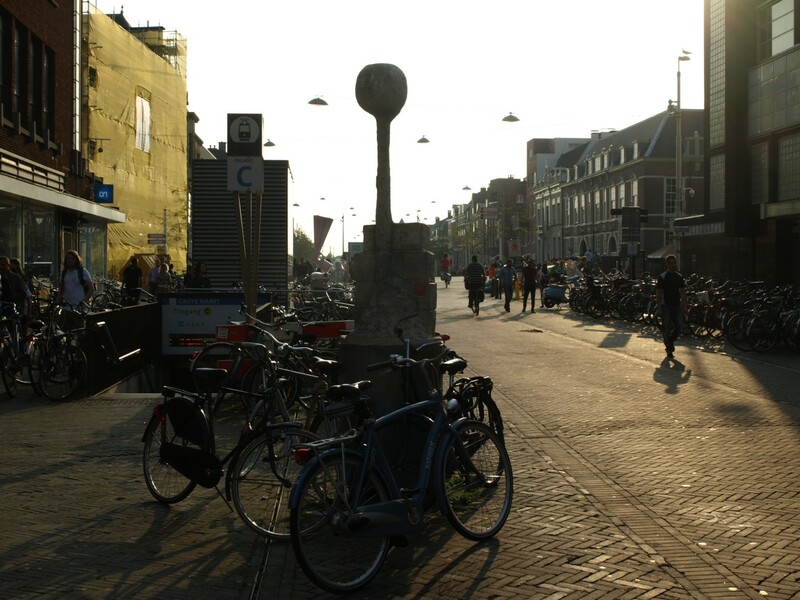 Click here to read the review (in Dutch). 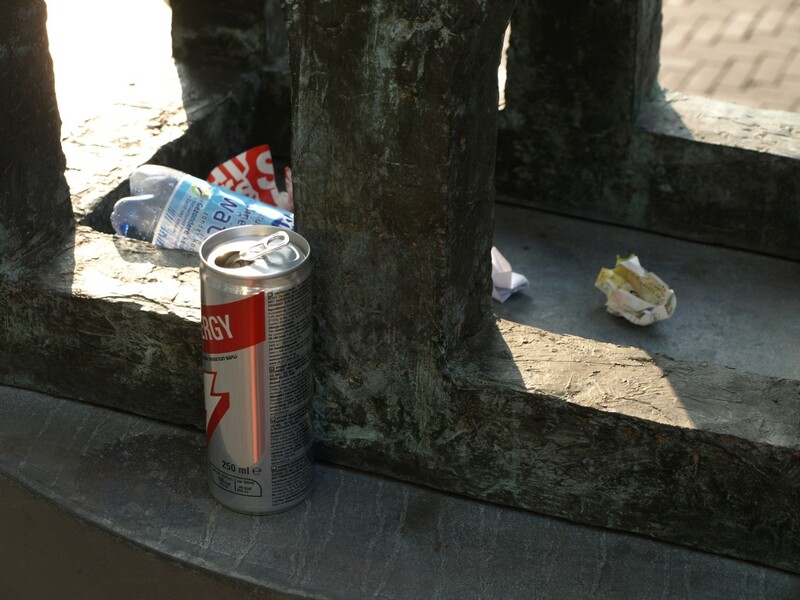 Being a Puckey fan, i can’t say i’m a fan of this particular monument. 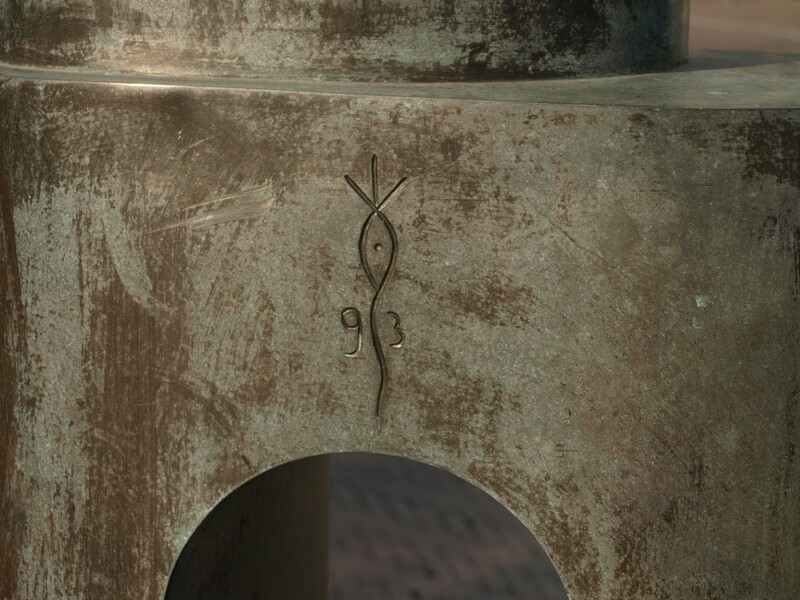 I explain that in the VLR article, so i won’t say much about it here. 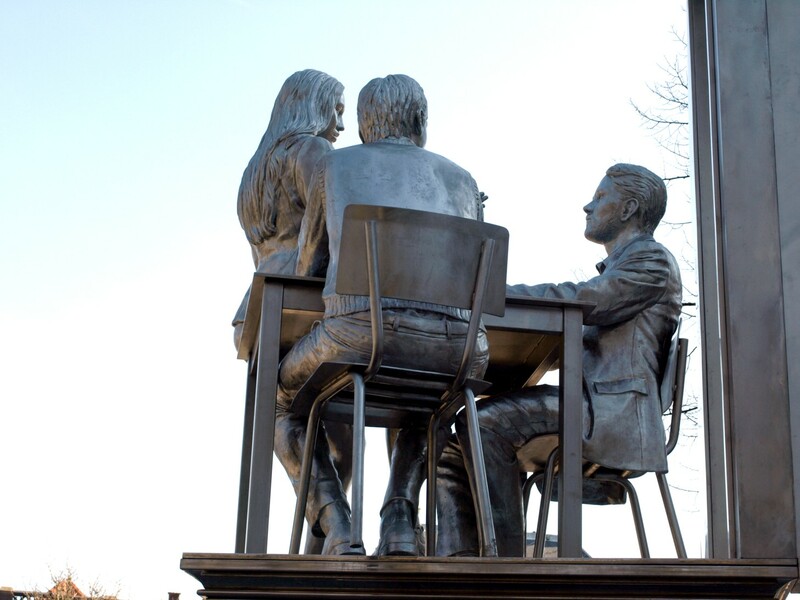 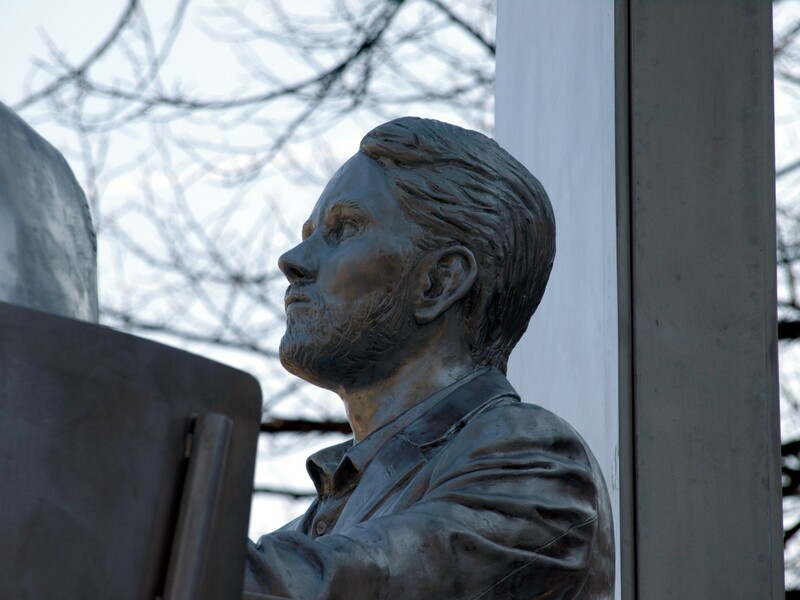 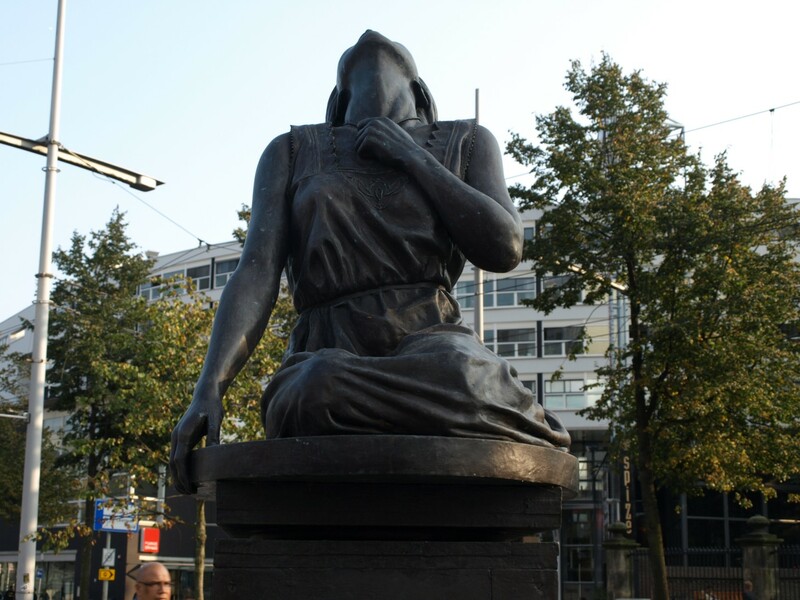 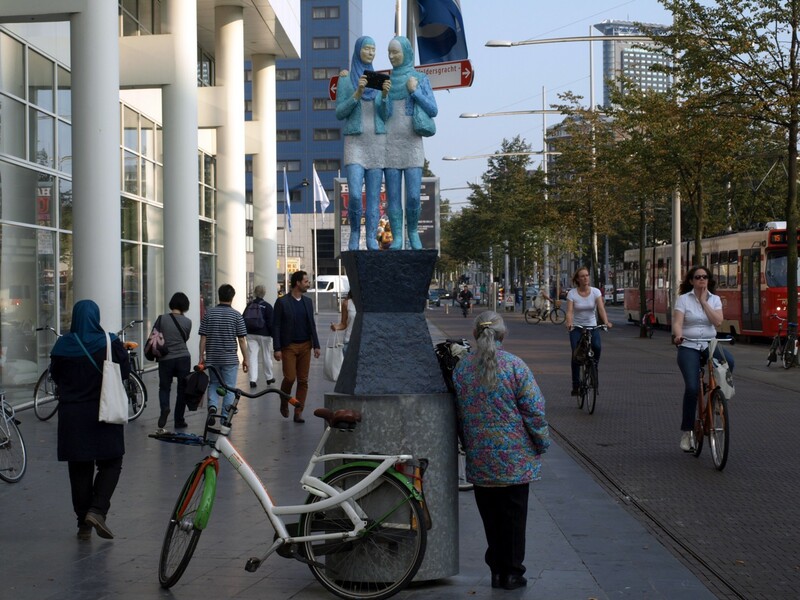 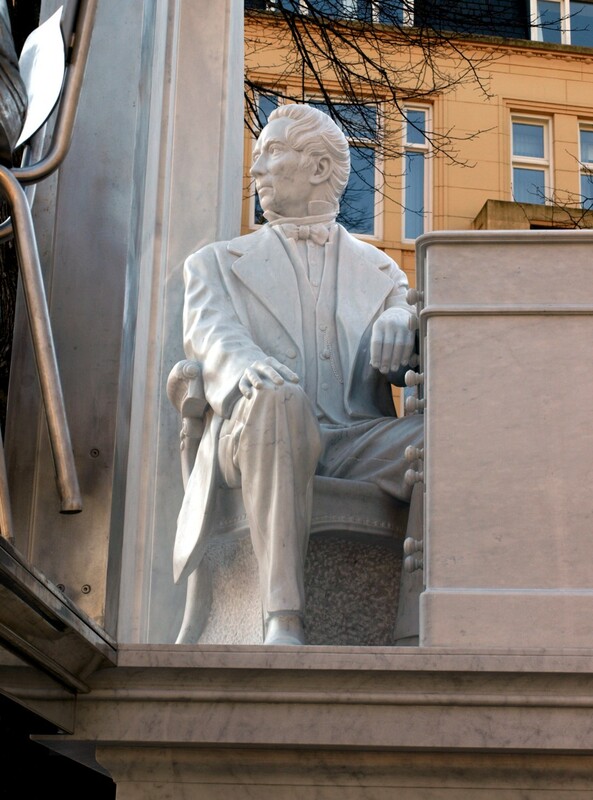 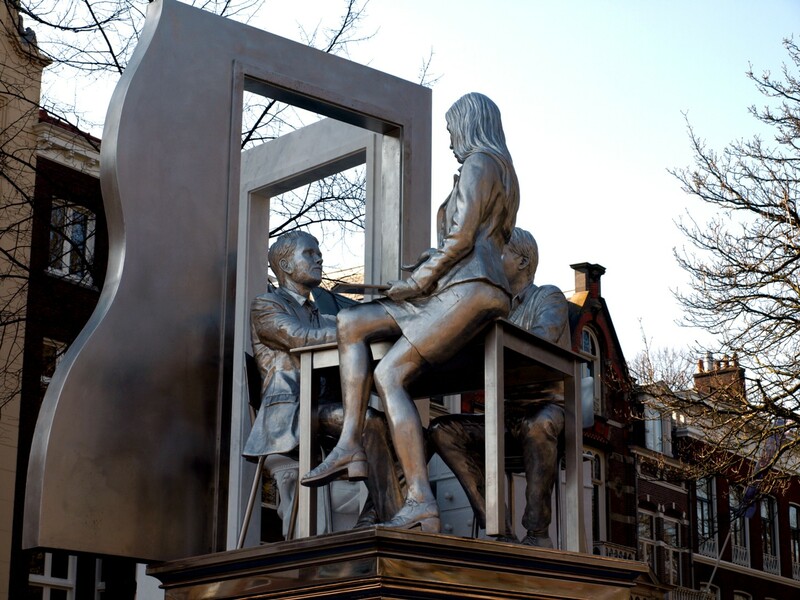 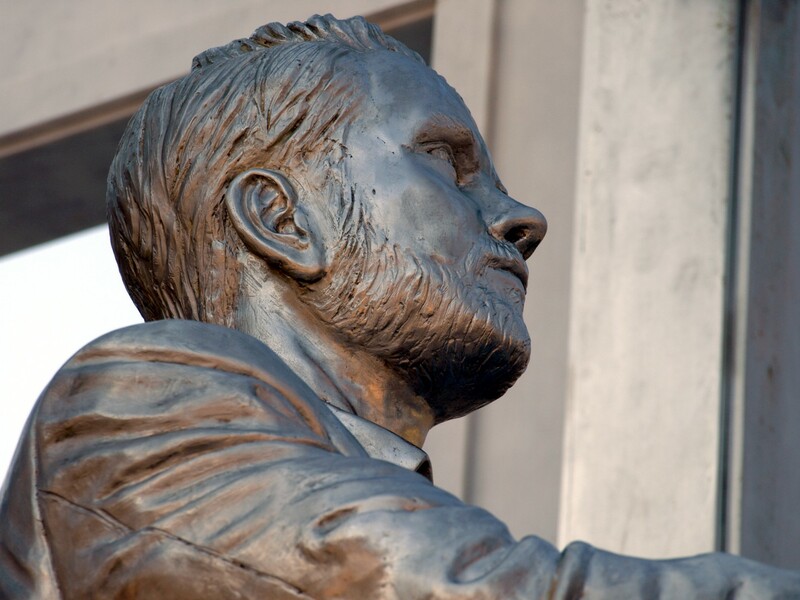 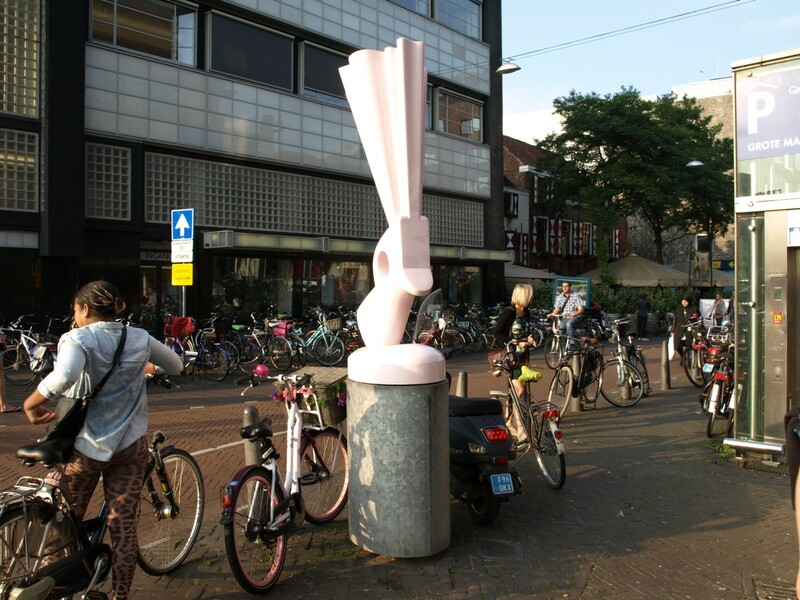 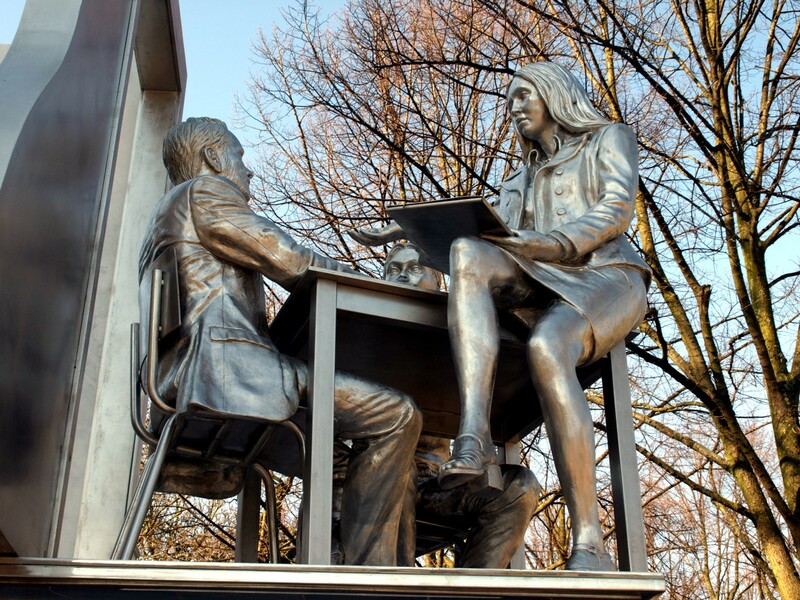 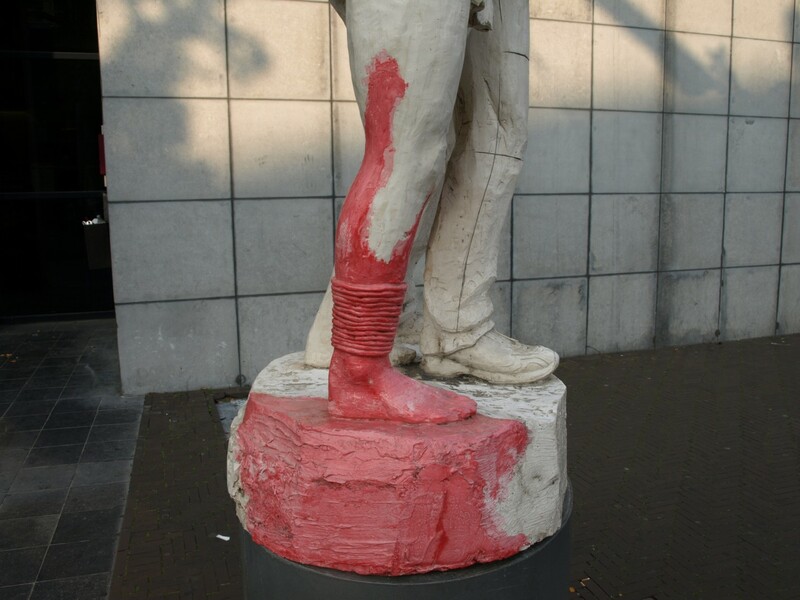 The idea for the monument of the 19th-century politician, who was the founder of the modern Dutch Constitution, seems to have been stimulated by the present trendy wave of ‘adhering to our shared values’ in politics. 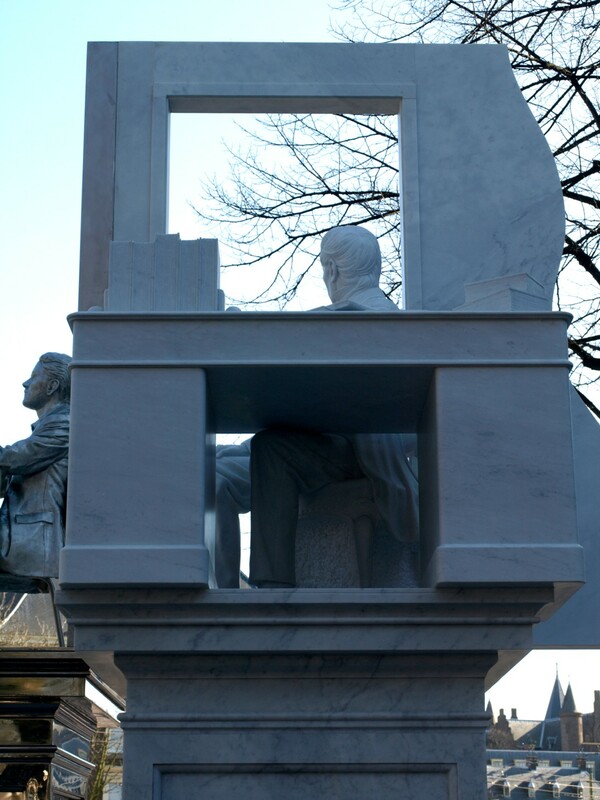 This pompous policy seems to have got an appropriate monument now. 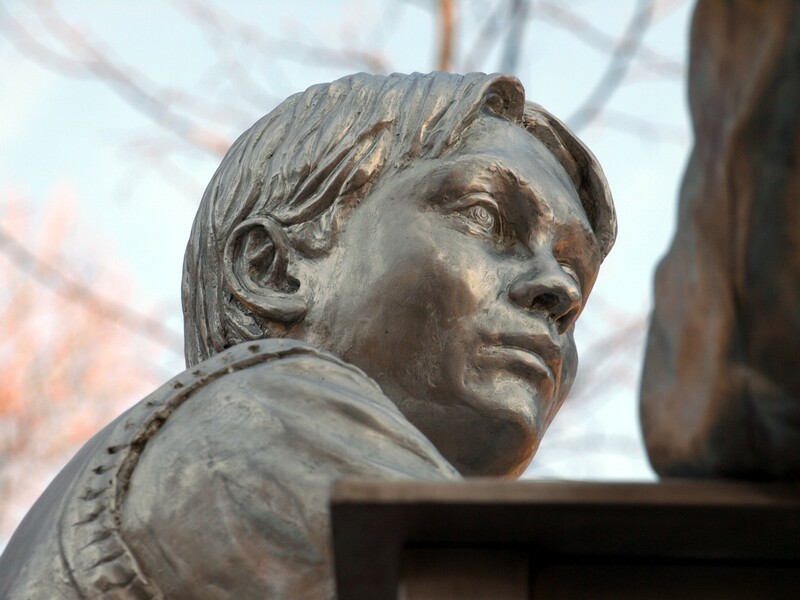 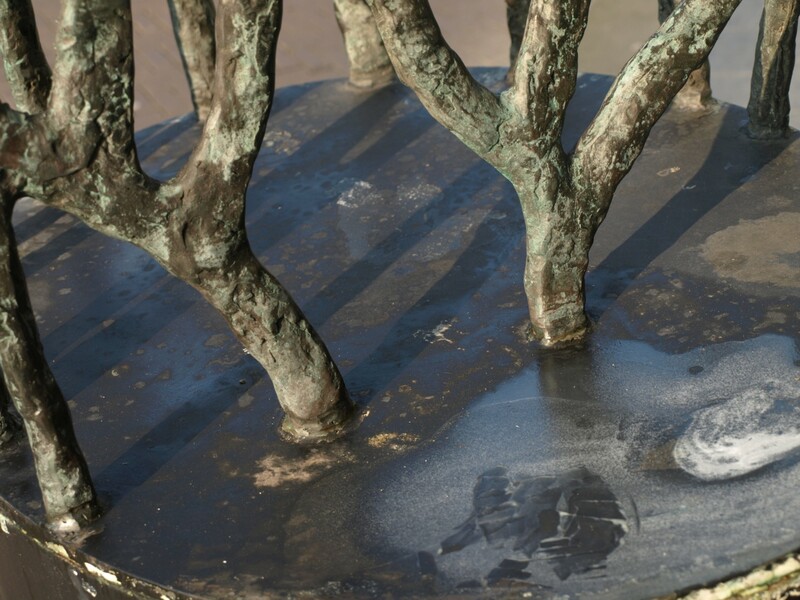 However, i should say there are some wonderful details in the sculpture. 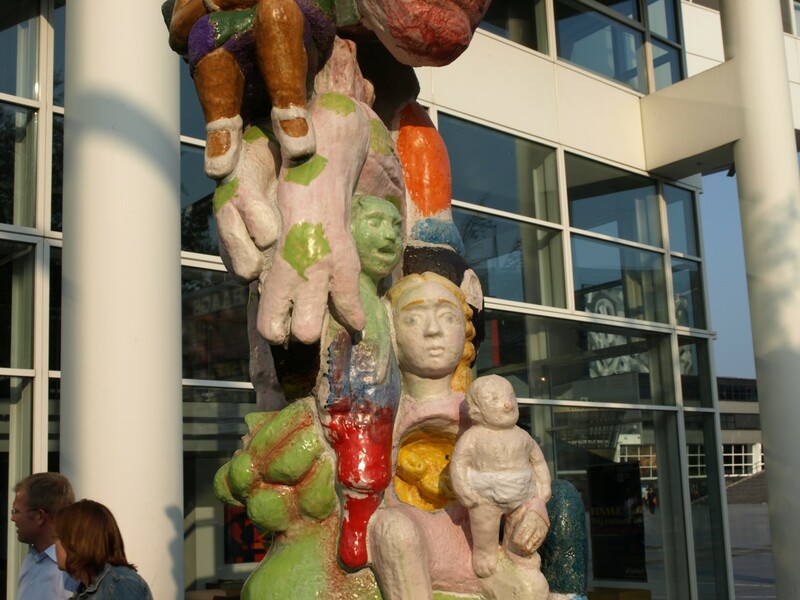 Although they are difficult to see, as they are all on high pedestals. 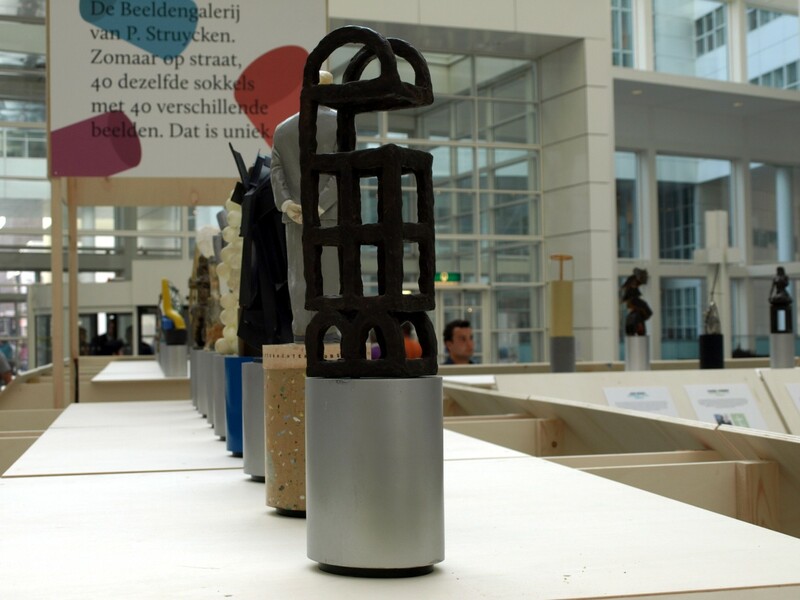 Titled Remembered Always… Stroom has organized a modest exhibition in The Hague town hall to show models of two newly designed monuments. 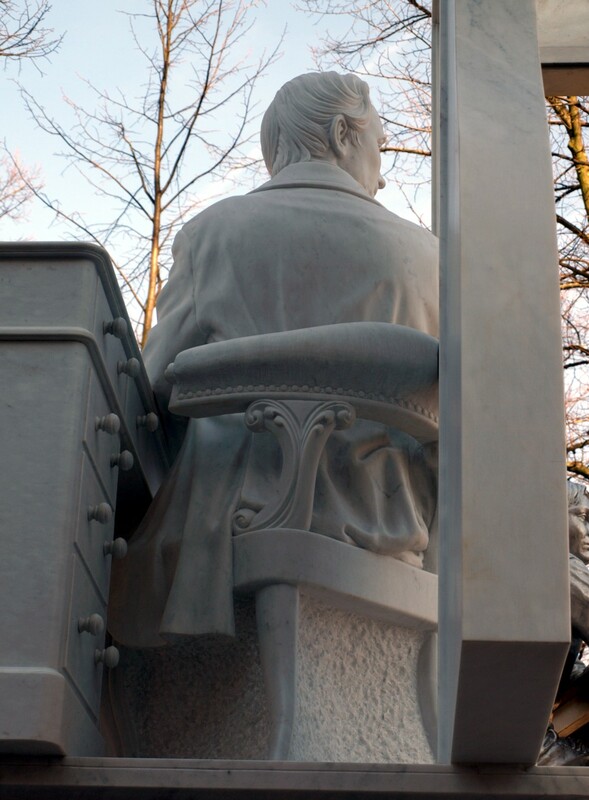 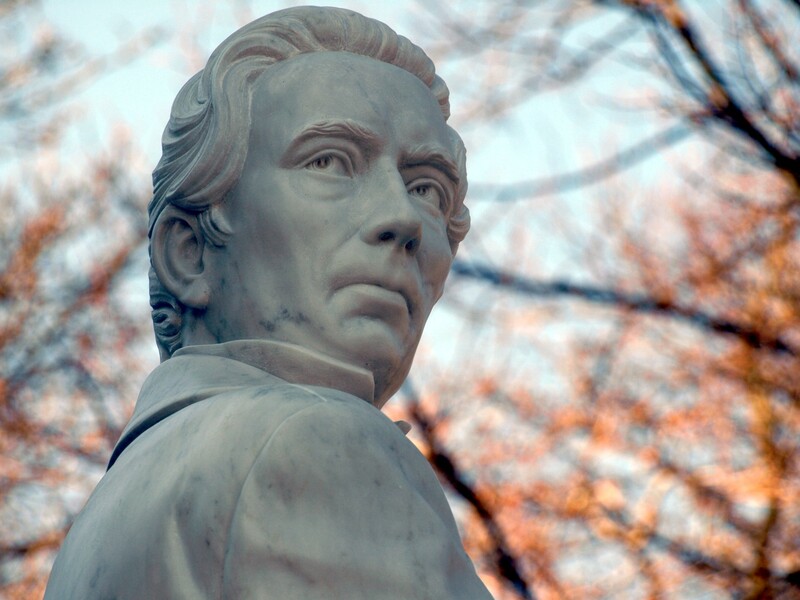 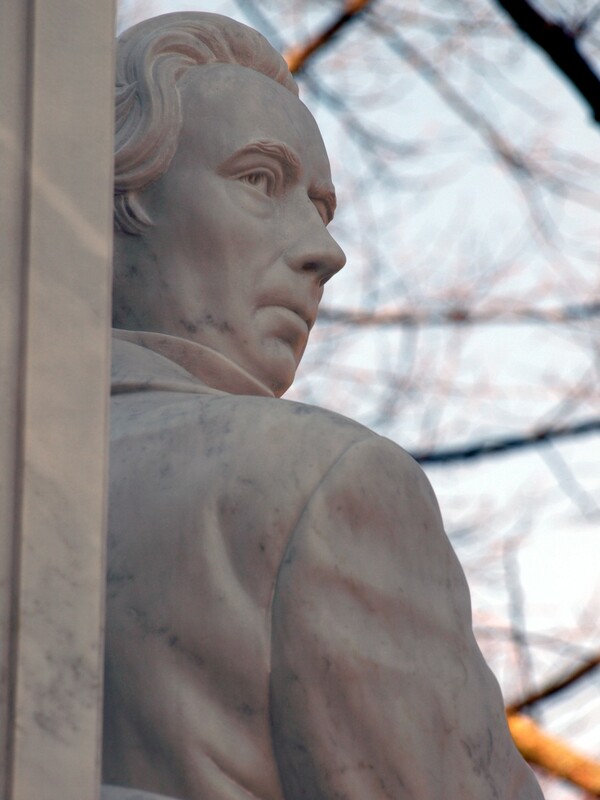 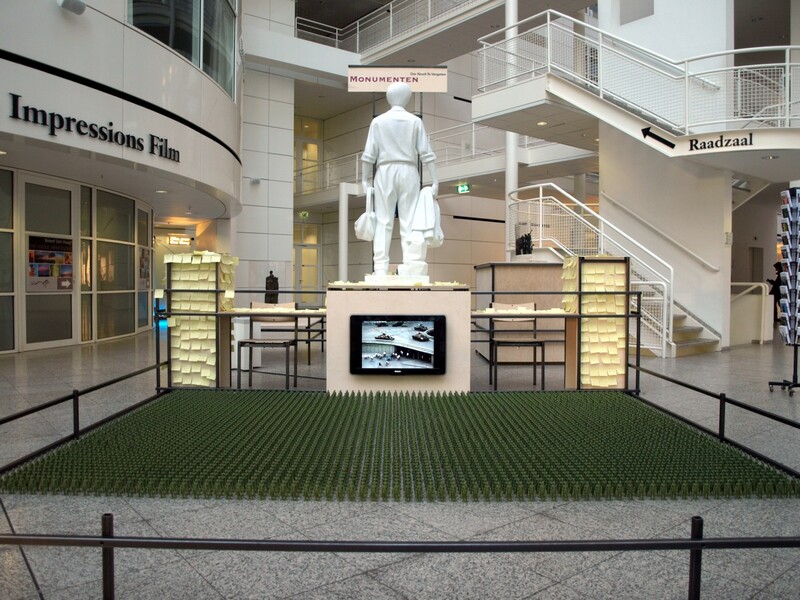 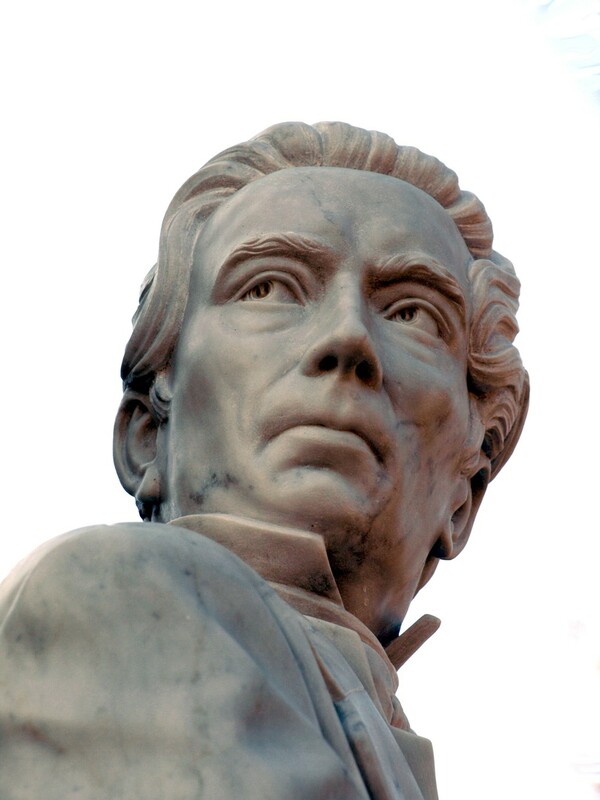 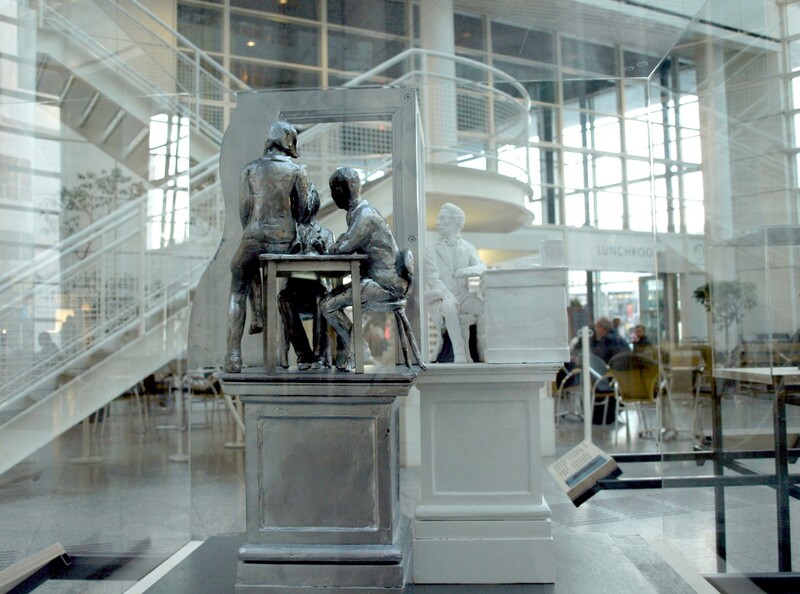 There is a model of Thom Puckey’s new monument for Dutch 19th century liberal prime minister Johan Rudolph Thorbecke (1798-1872) who implemented the modern Dutch constitution. 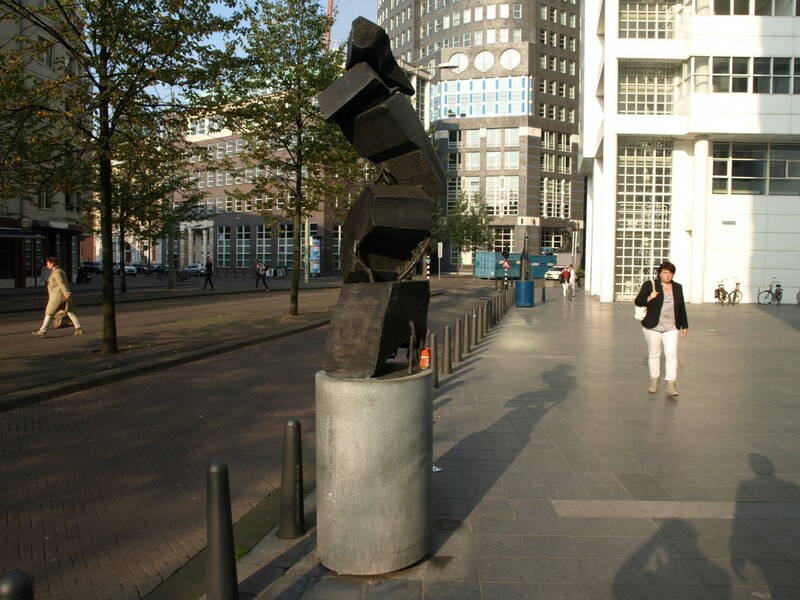 The second design is for a monument by Ingrid Mol for Princess Juliana (1909-2004) who was queen of the Netherlands from 1948 to 1980.
or to remember decisive moments in history – like this monument for the victims of the Japanese occupation of the former Dutch East Indies, by Jaroslawa Dankowa (1925-1999) –. 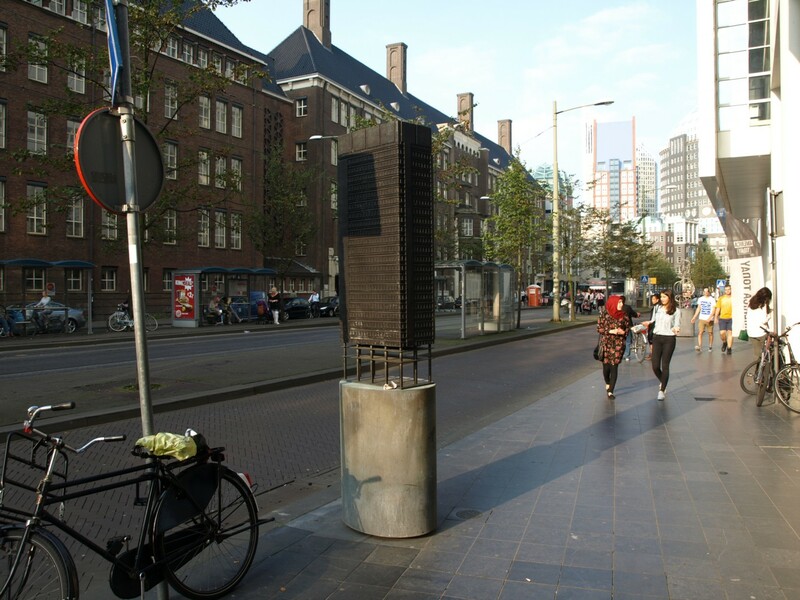 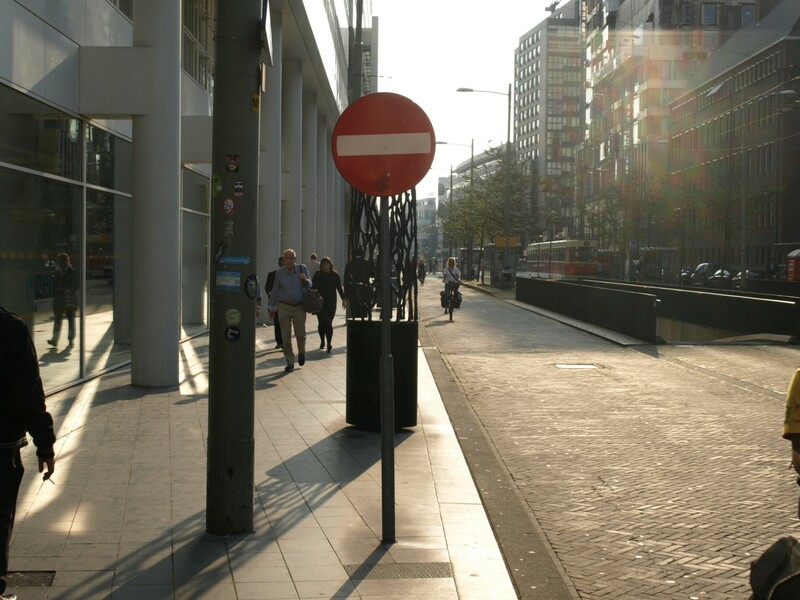 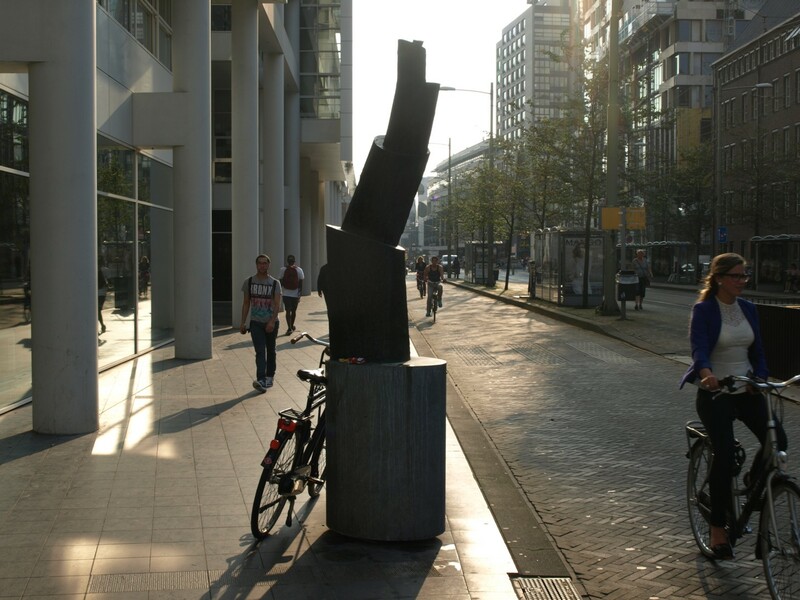 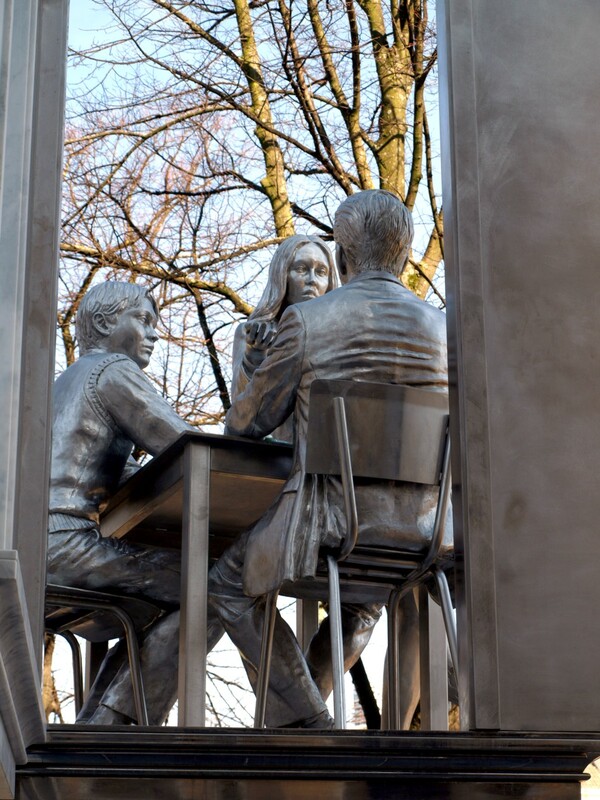 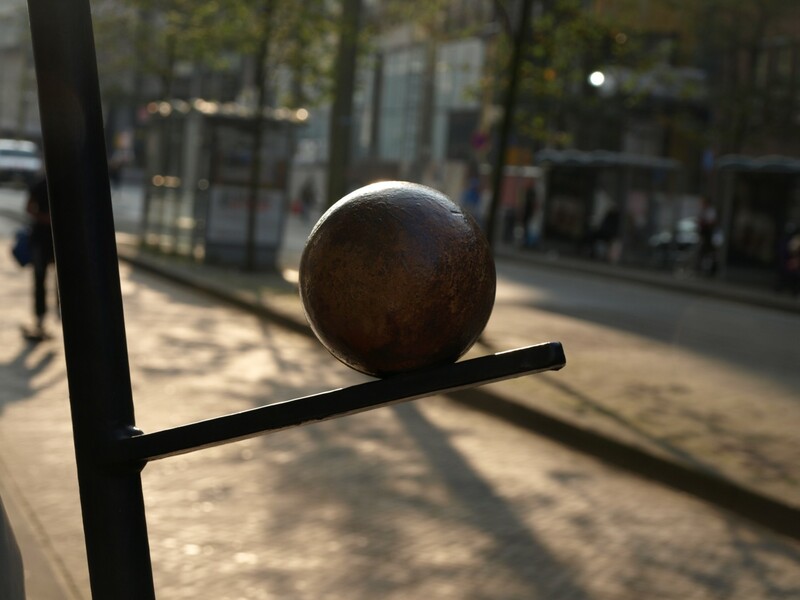 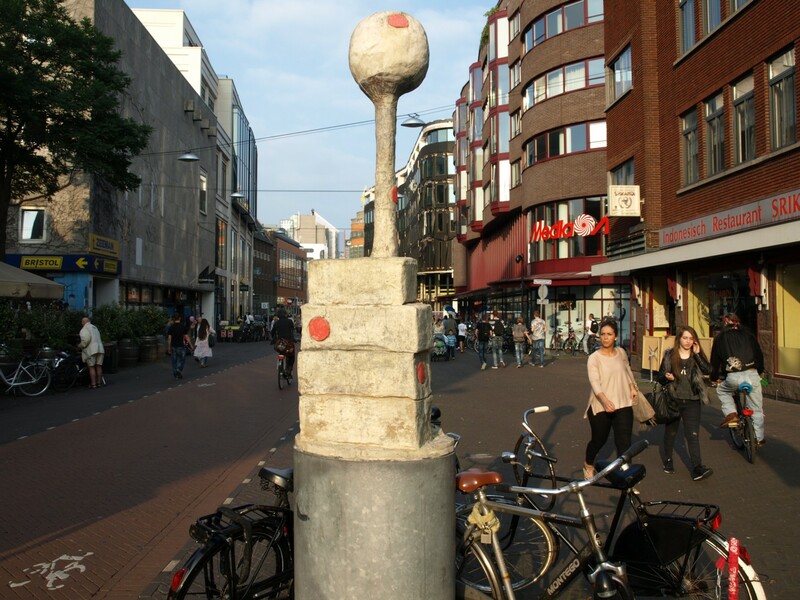 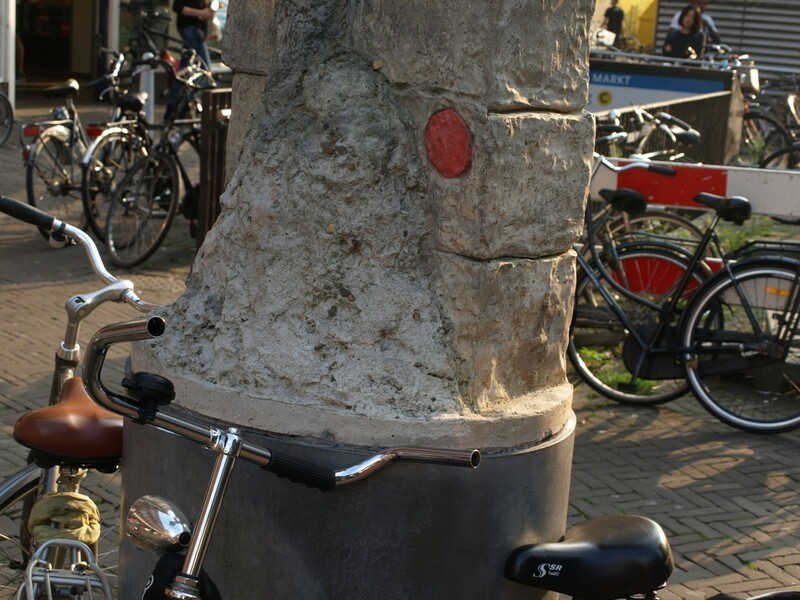 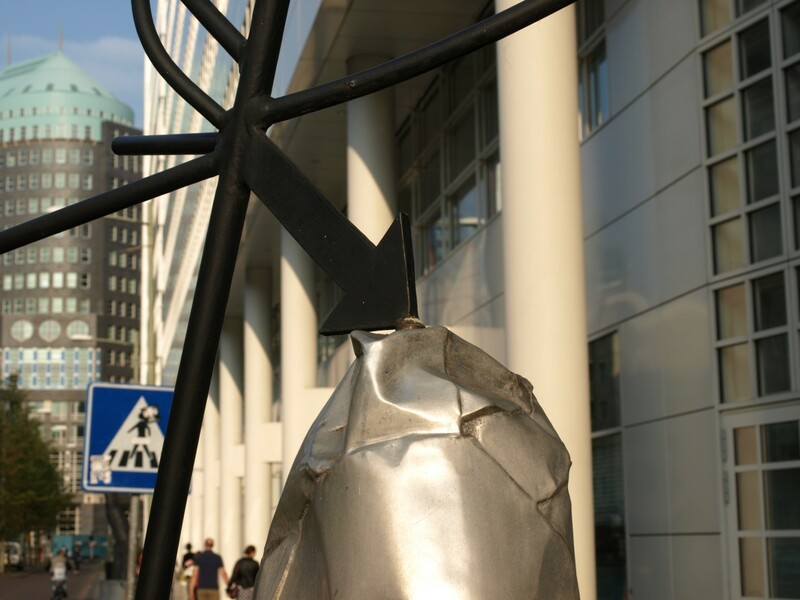 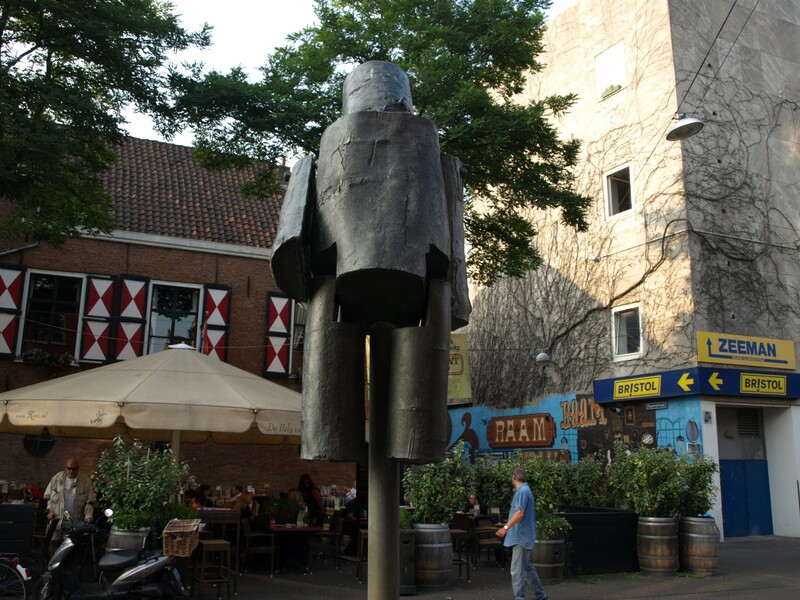 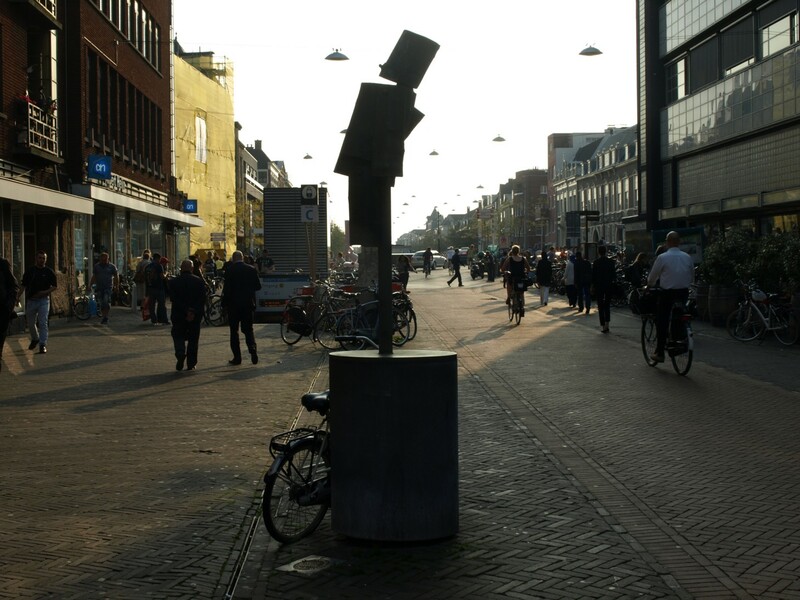 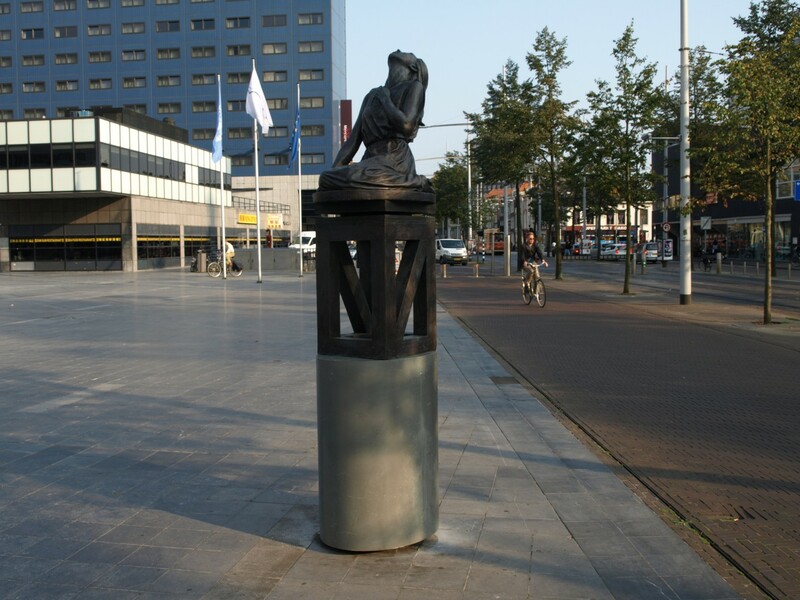 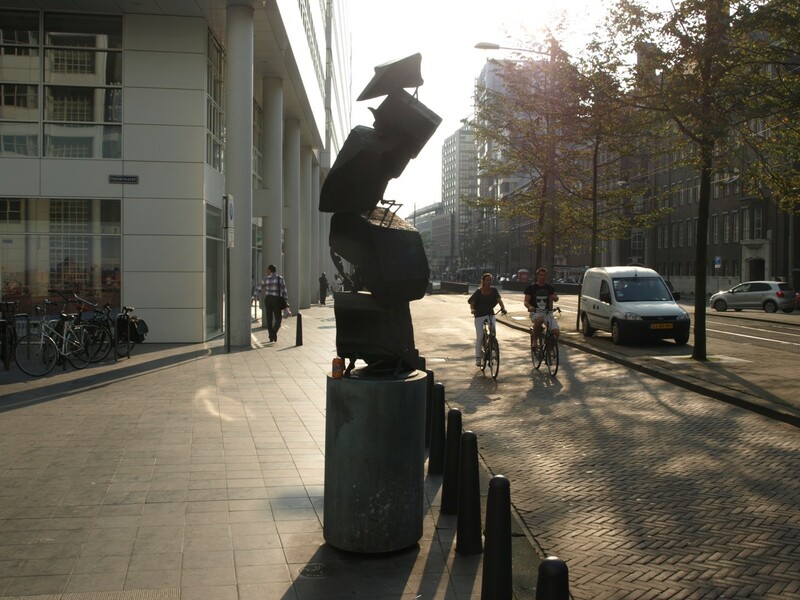 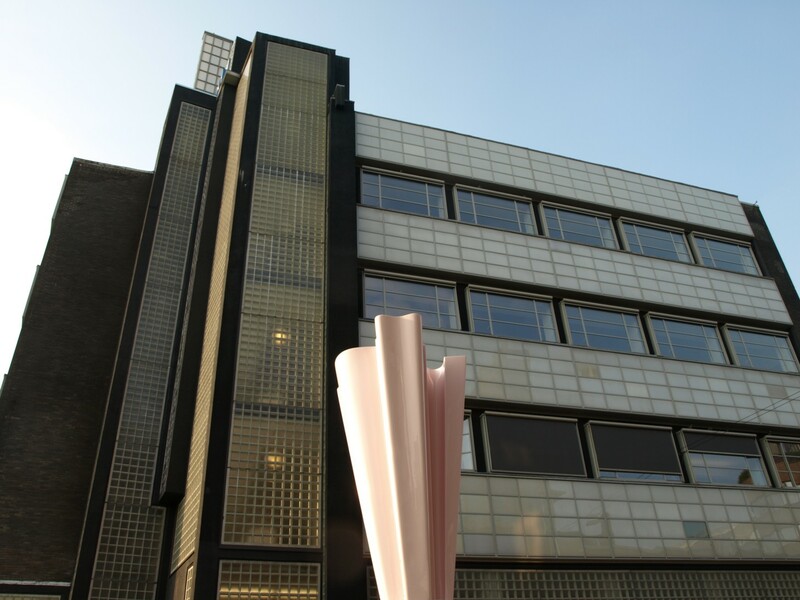 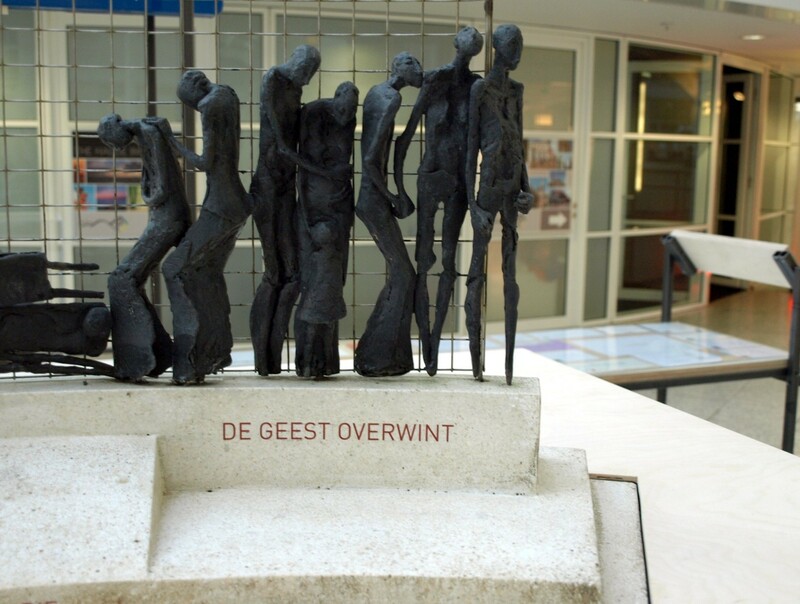 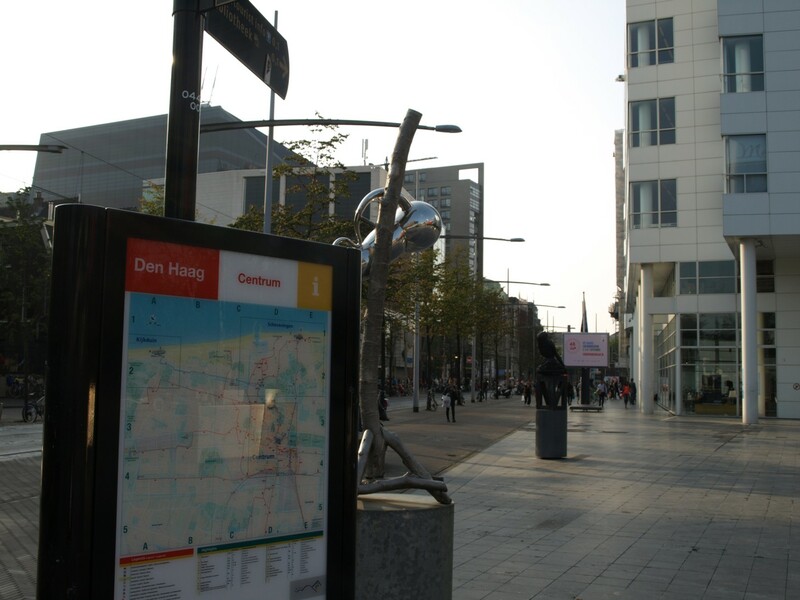 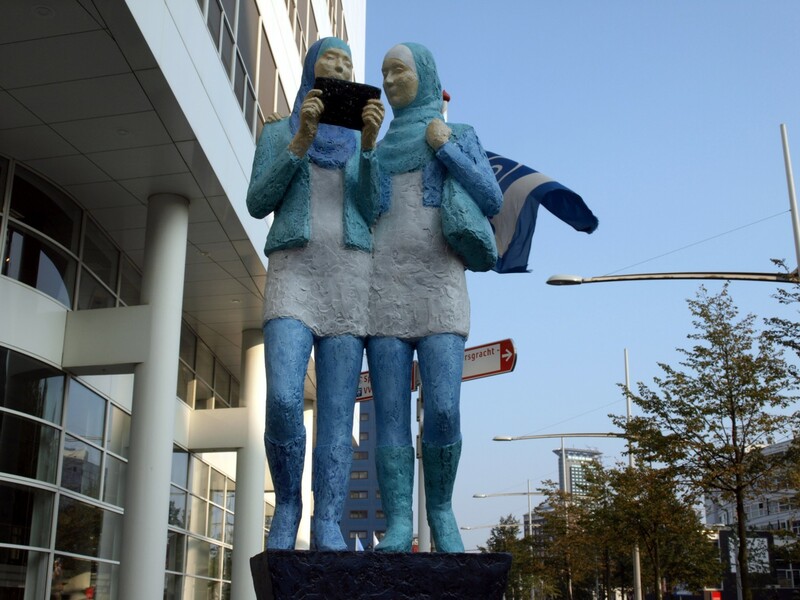 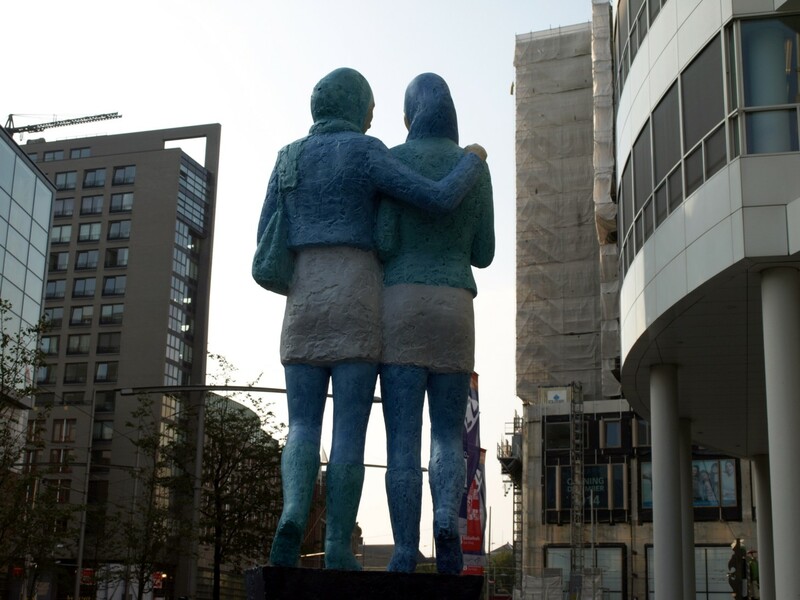 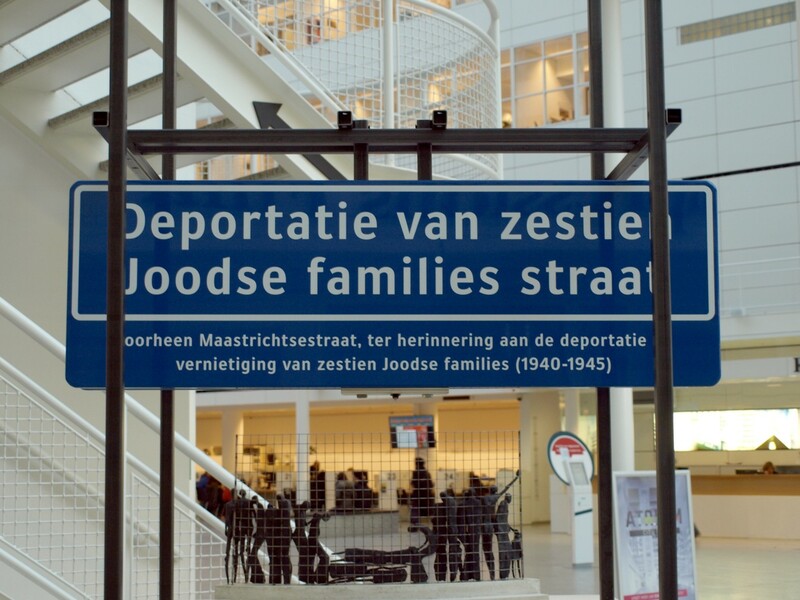 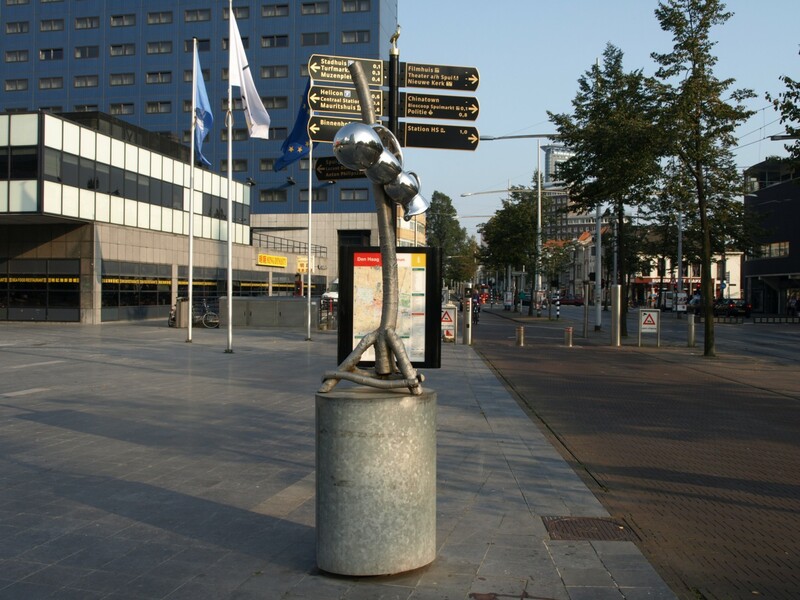 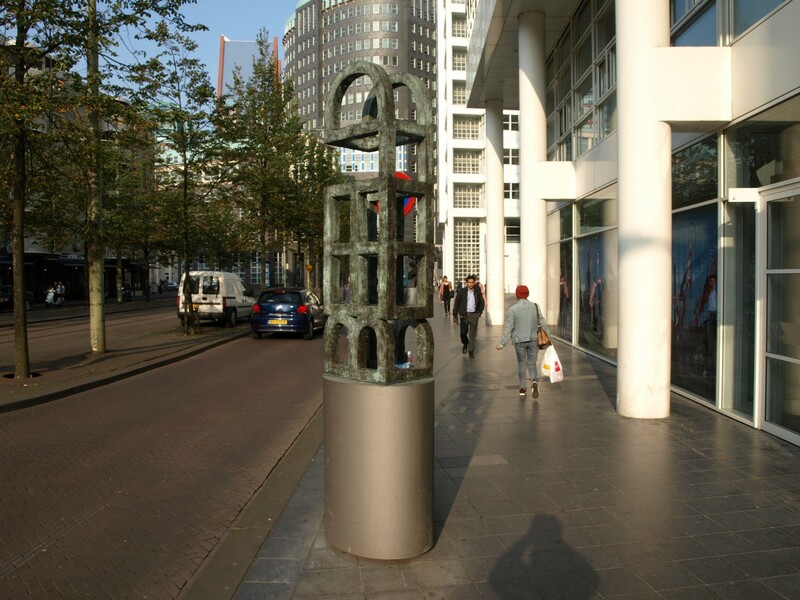 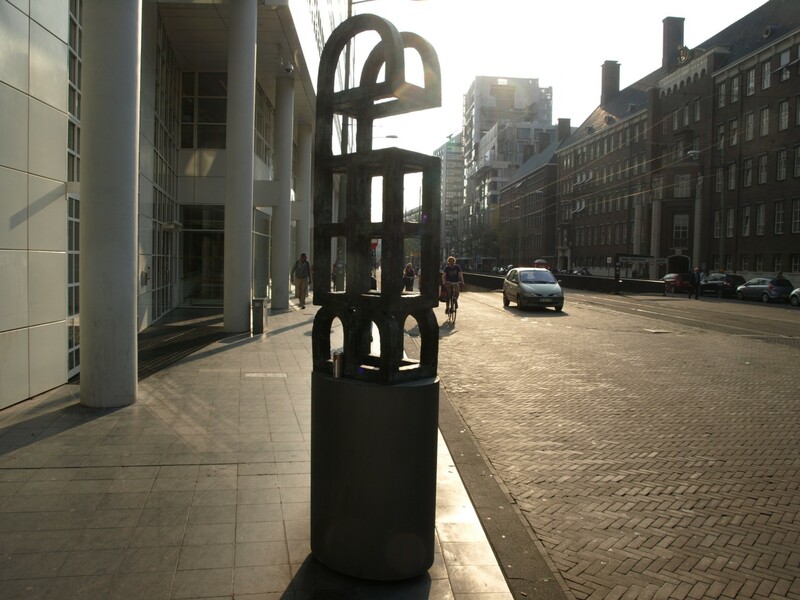 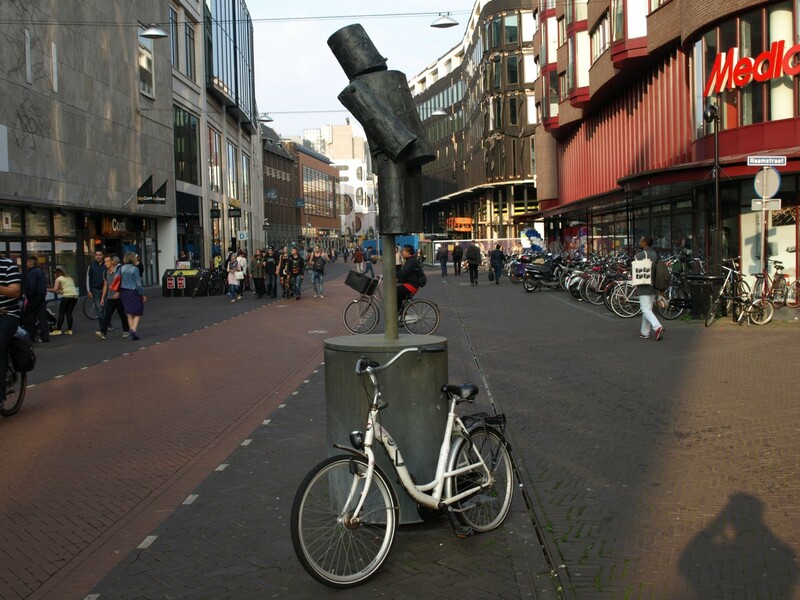 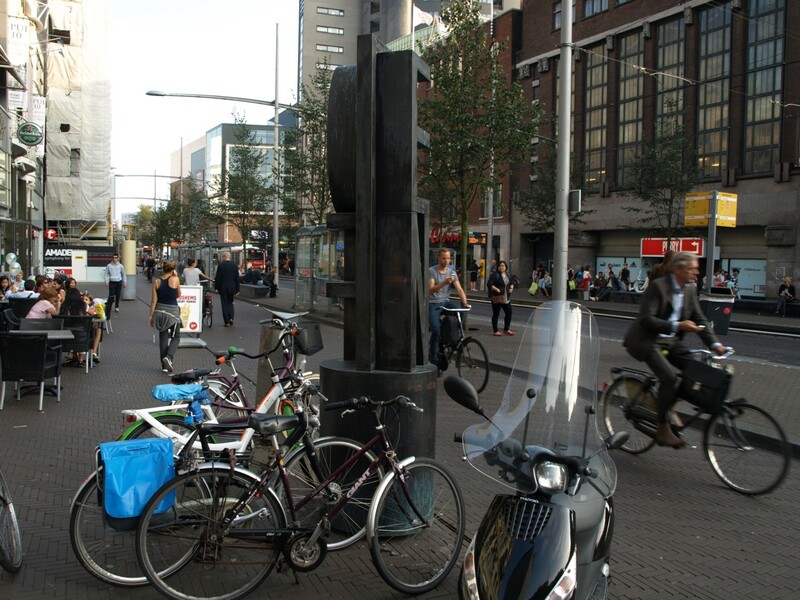 When it became known recently that 16 Jewish families were deported from Maastrichtsestraat (Maastricht street) in The Hague, during the German occupation, artist Jonas Staal came with an alternative name as a monument for the street: Deportatie van zestien Joodse families straat (Deportation of Sixteen Jewish Families Street). 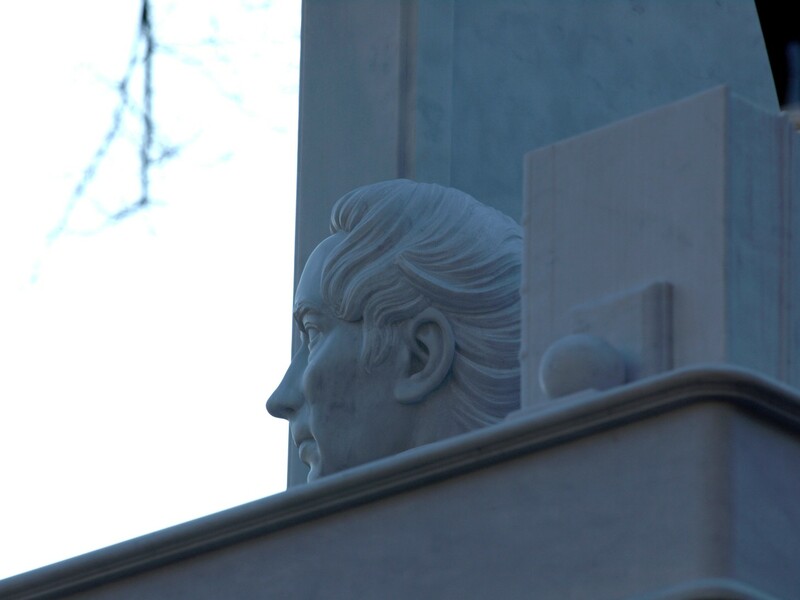 This new name is not officially in use, but some people living there do use the new name. 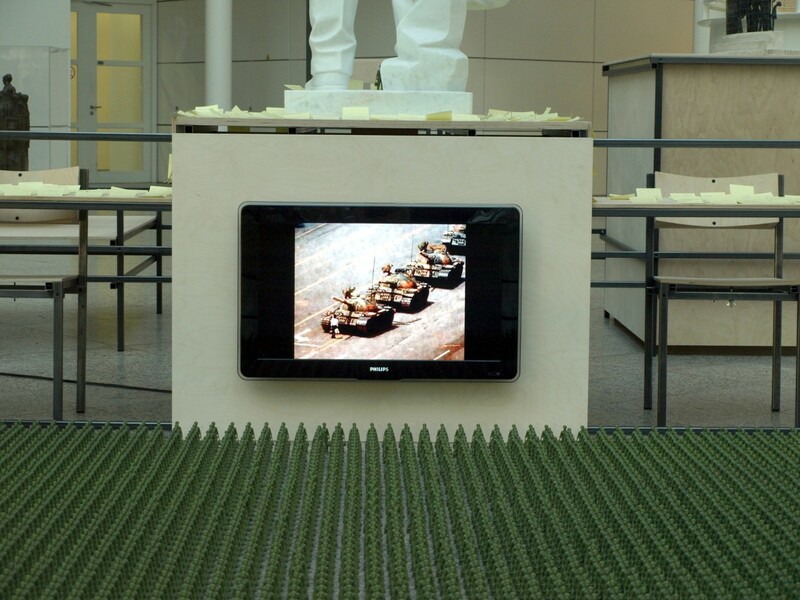 Most interesting is however Fernando Sánchez Castillo’s installation called Made in China, which represents the so called Tank Man, after the Chinese student who defied the Chinese army all on his own in 1989. 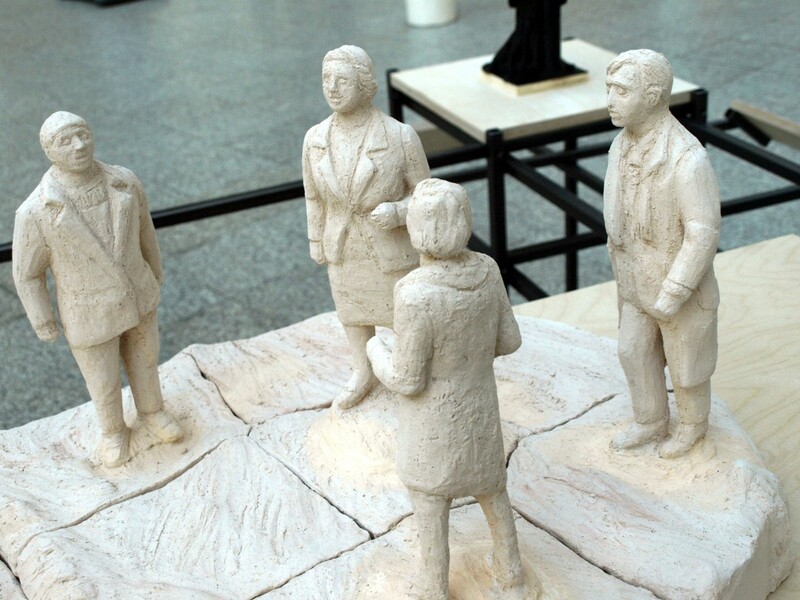 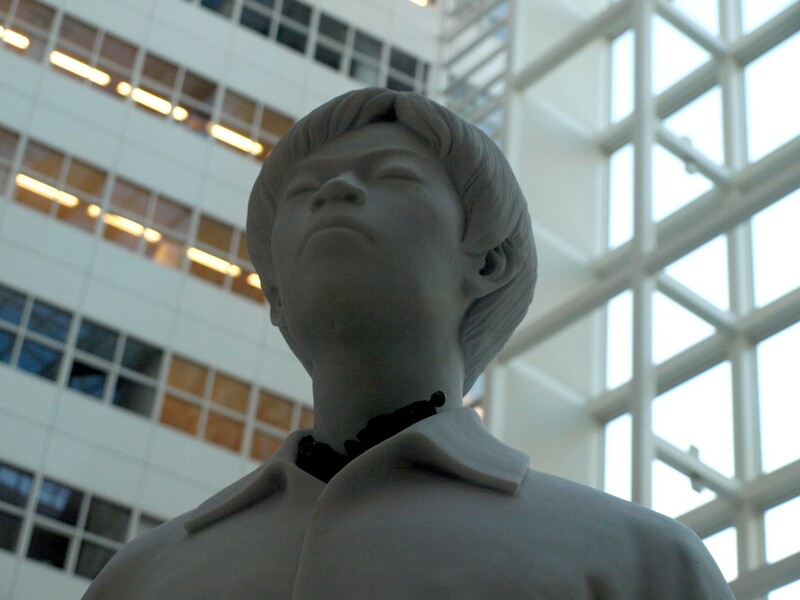 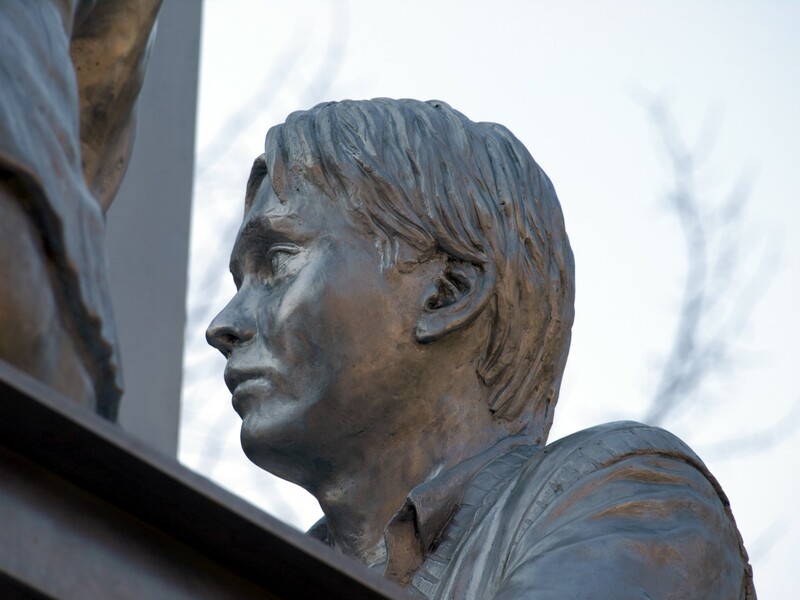 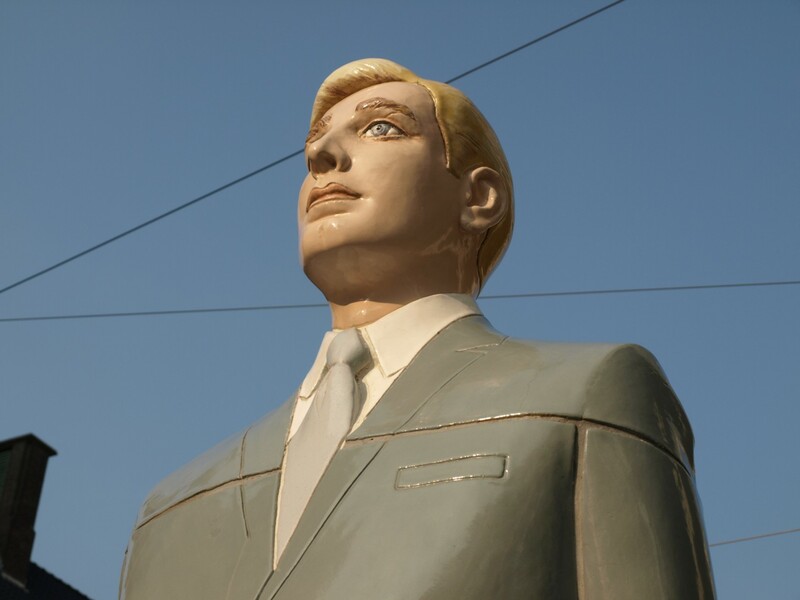 The marble statue as well as the plastic models (of which you can obtain one if you add your comments on democracy and human rights) are all made in China, and the Tank Man Prize, to be awarded annually, is also part of the concept. 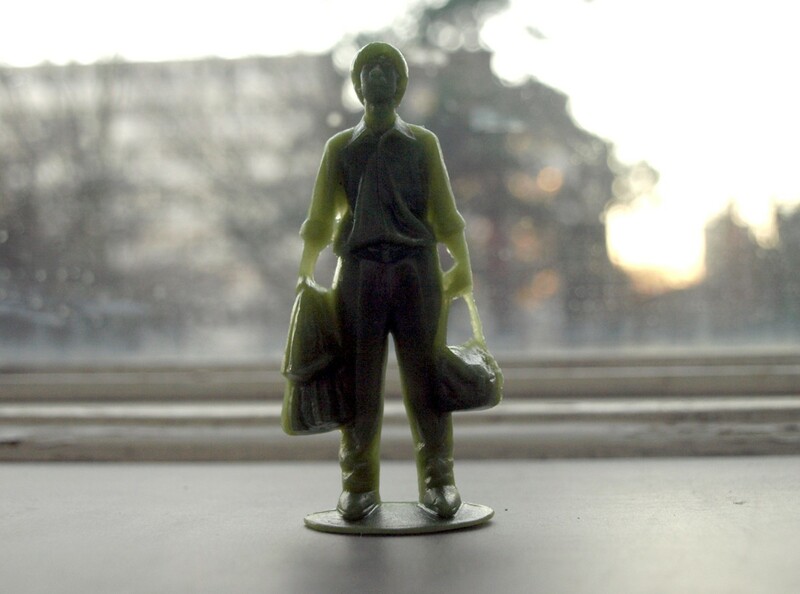 Personally i cherish my little stubborn Tank Man! 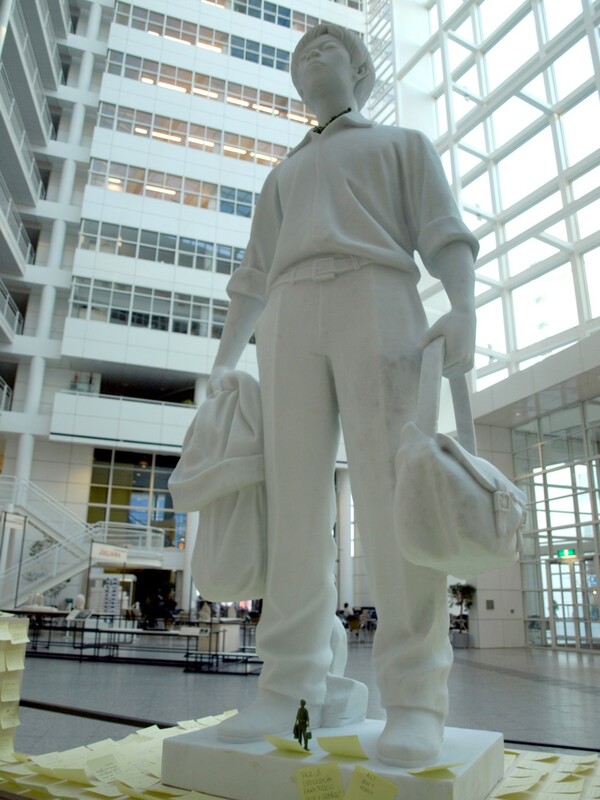 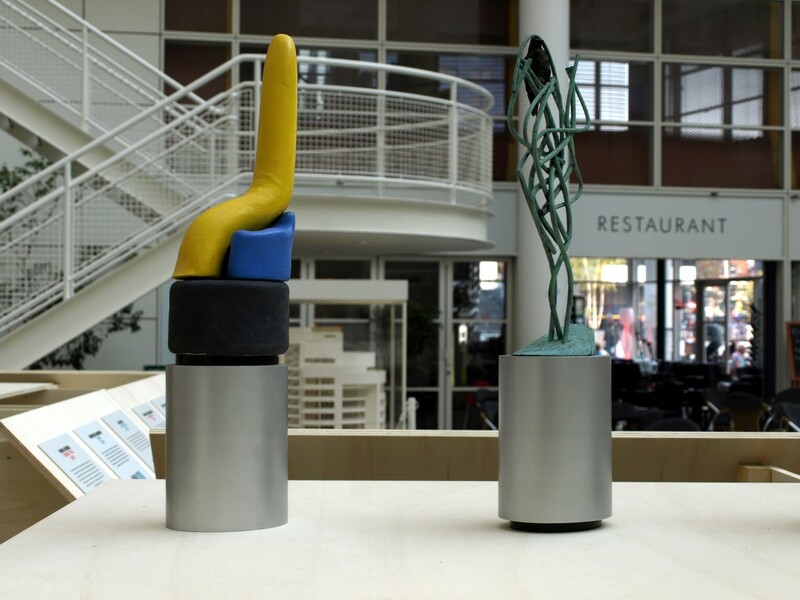 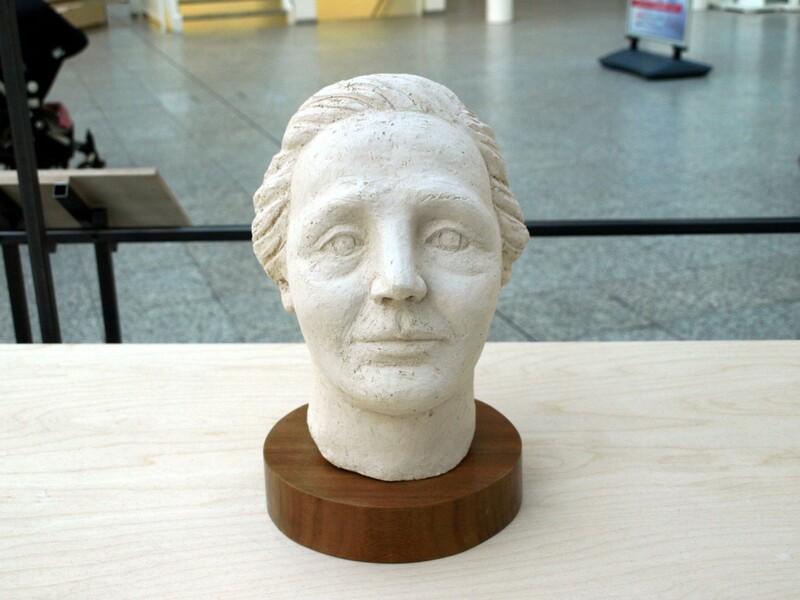 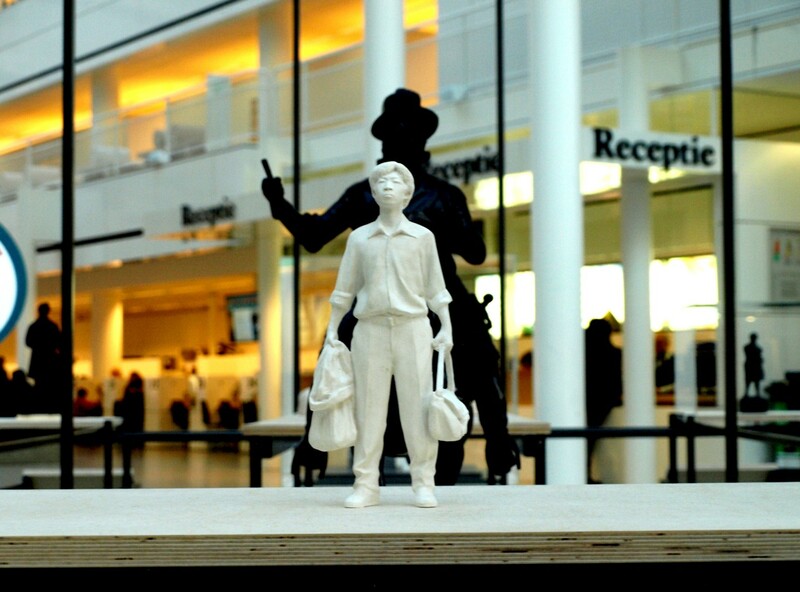 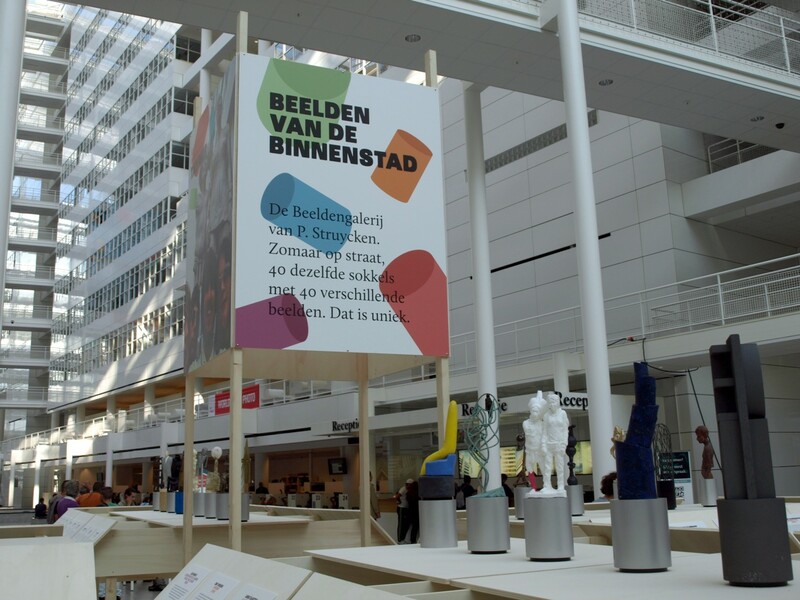 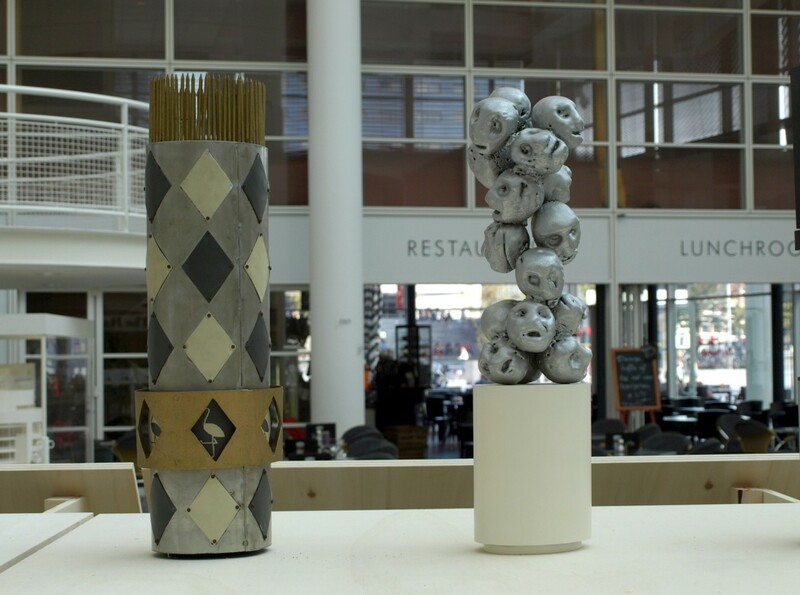 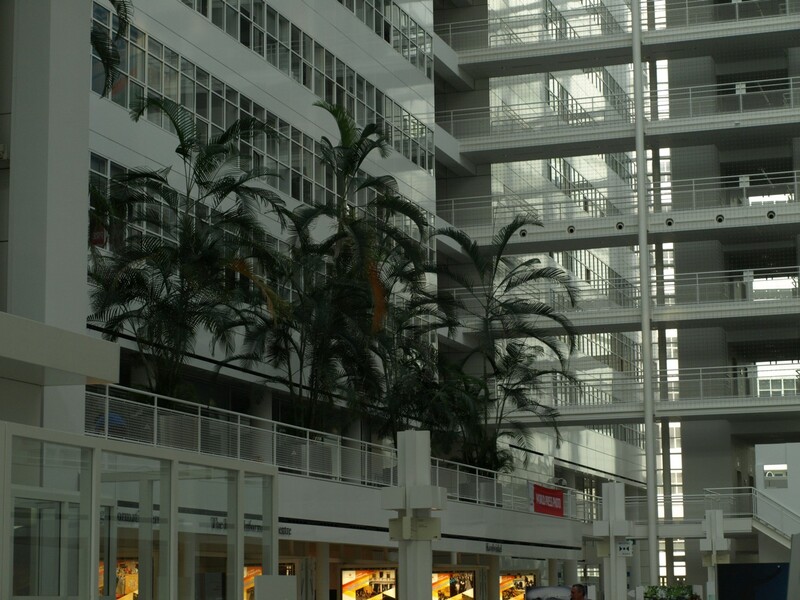 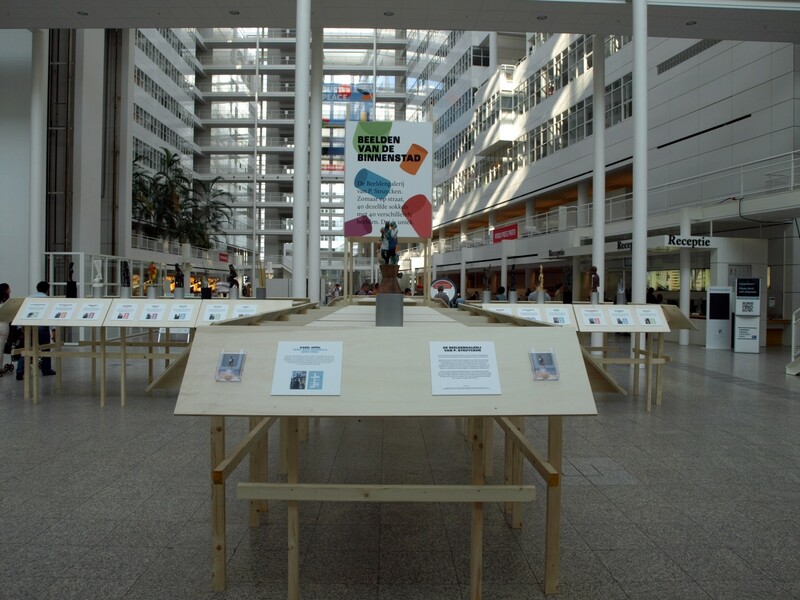 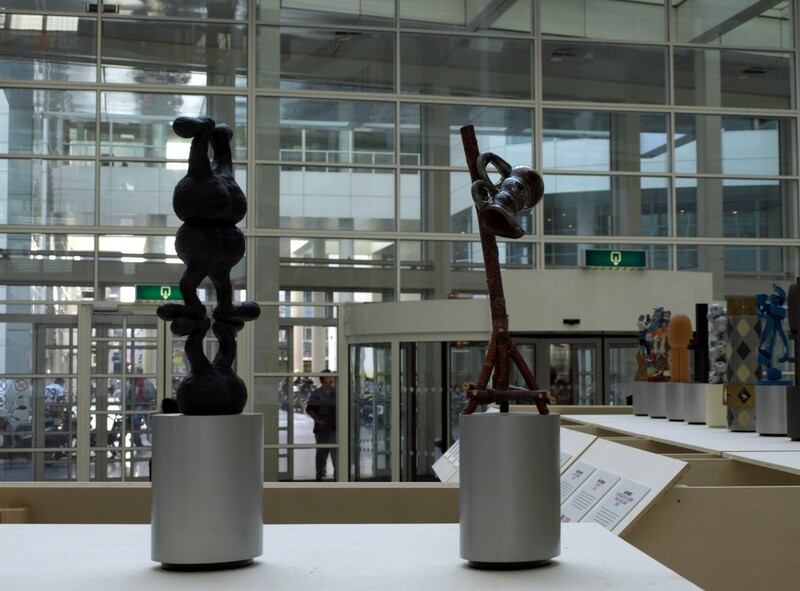 I went to the town centre city centre to see the small exhibition Beelden van de Binnenstad (Sculptures of the City Centre) in the Atrium of Town Hall. 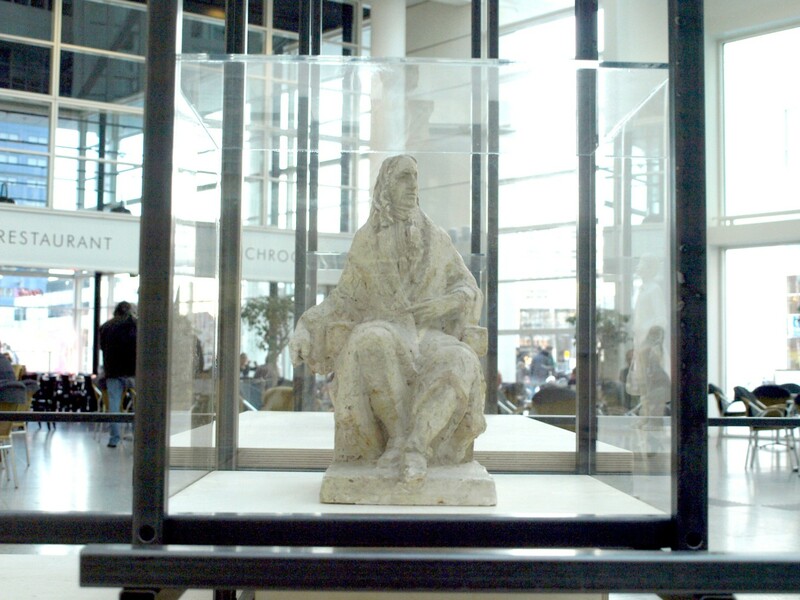 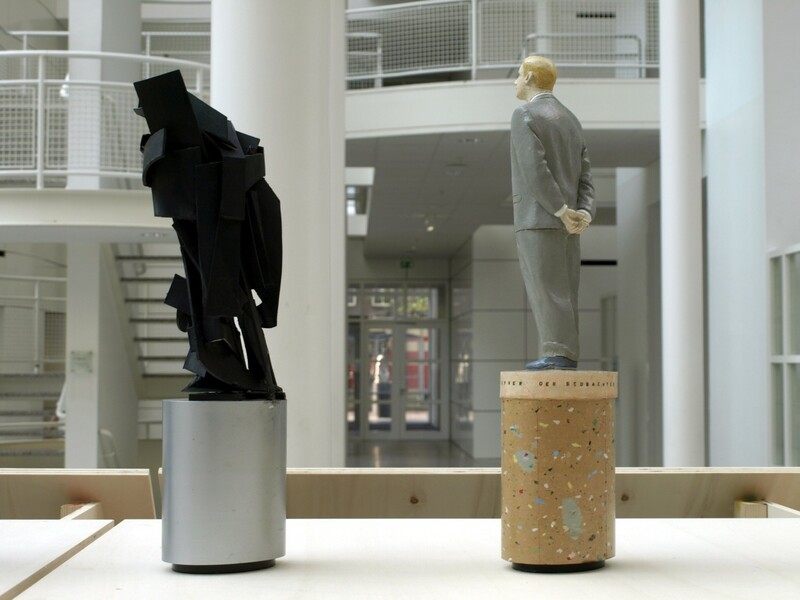 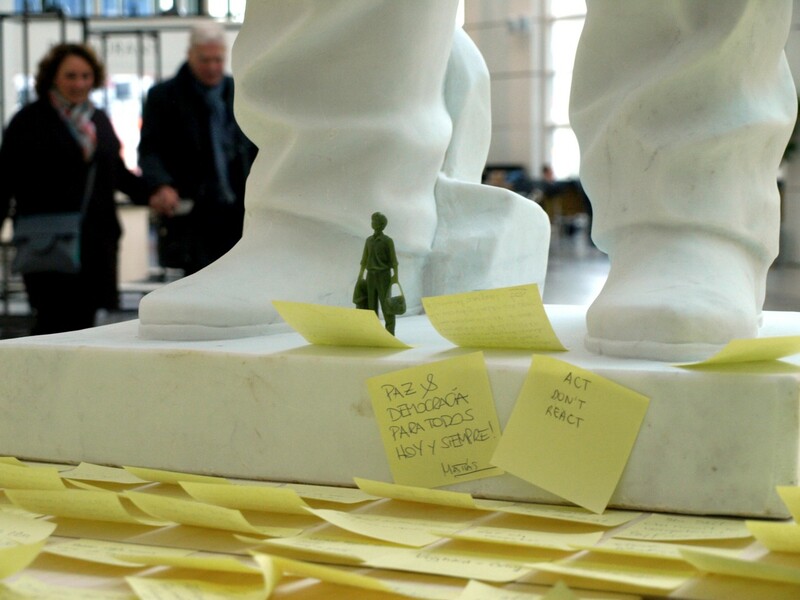 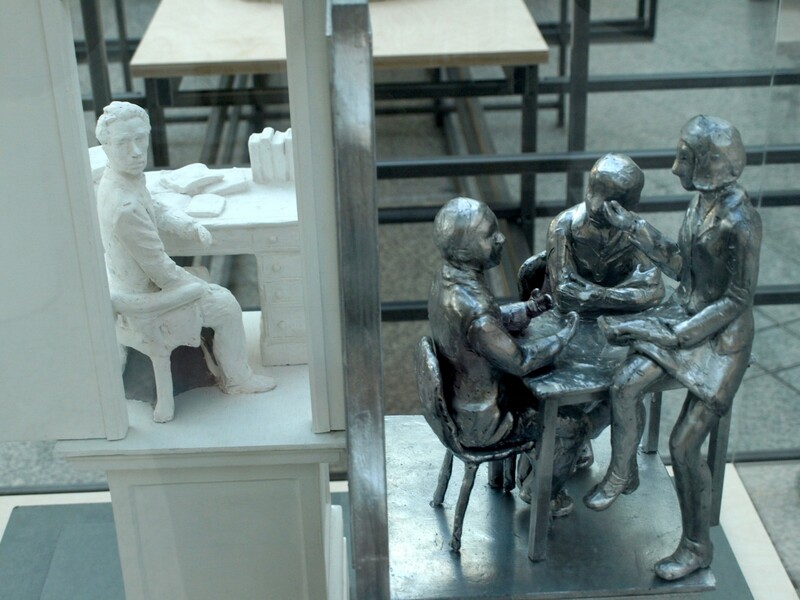 There you can see miniature models of the sculptures which have been made during the last two decades for the gallery, usually called the Sokkelproject (Pedestal Project). 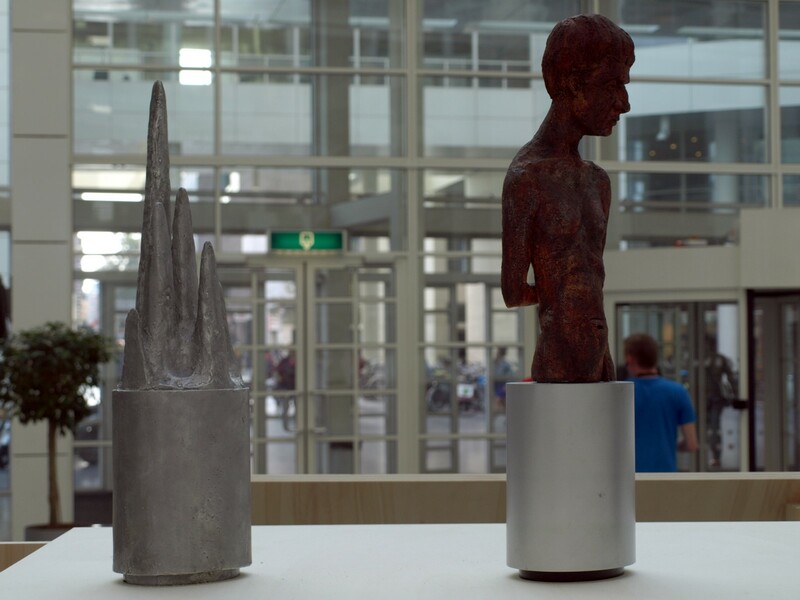 In the first picture you see models of Adam Colton’s untitled work (1996) and Gert Germeraad’s Mansportret (Portrait of a Man; 2002) and in this picture you see Christien Rijnsdorp’s De hef (The Lift Bridge; 2007) and Maria Roosen’s untitled work (2011). 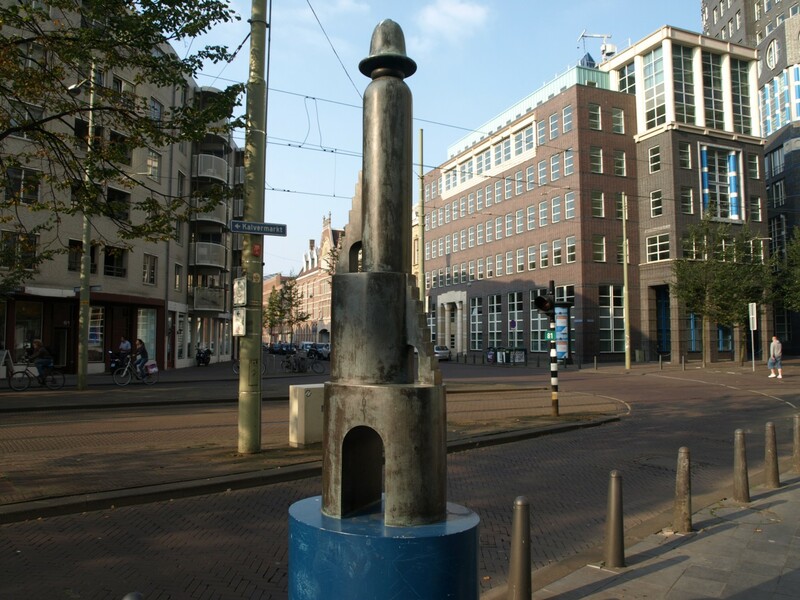 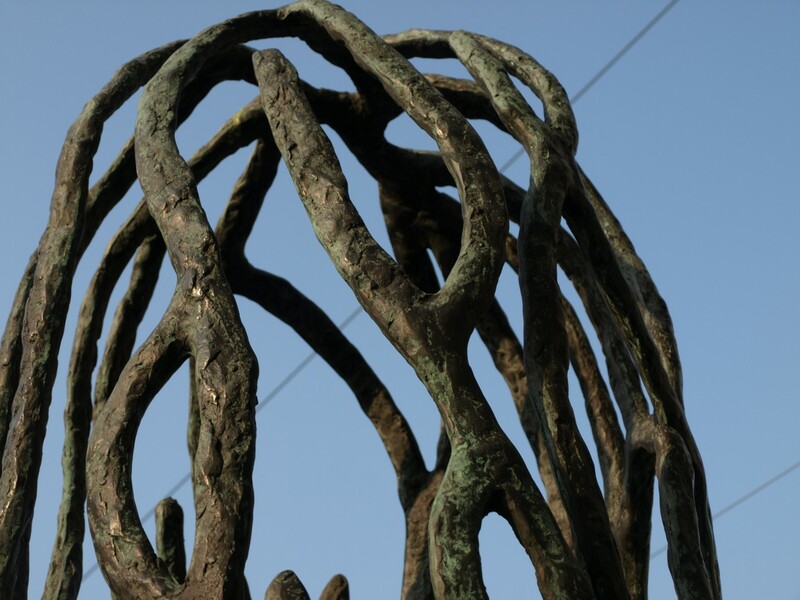 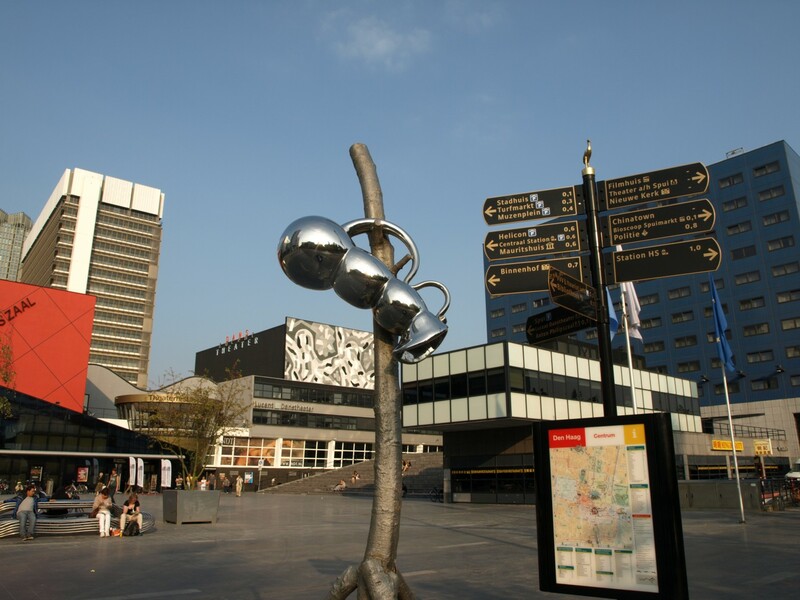 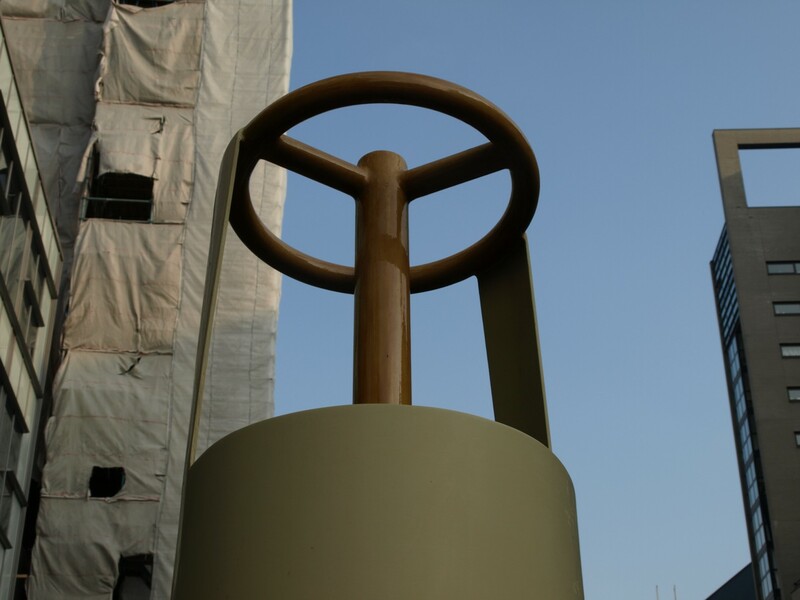 Sonja Oudendijk’s Bellevue-toren (Bellevue Tower; 1993) and Atelier Van Lieshout’s Veelhoofd (Many-Head; 2010). 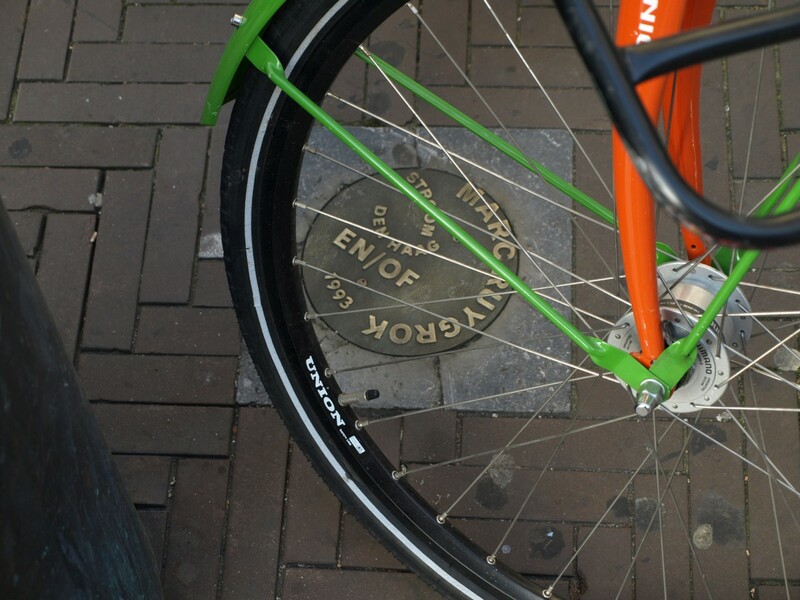 All models have a short explanation (in Dutch). 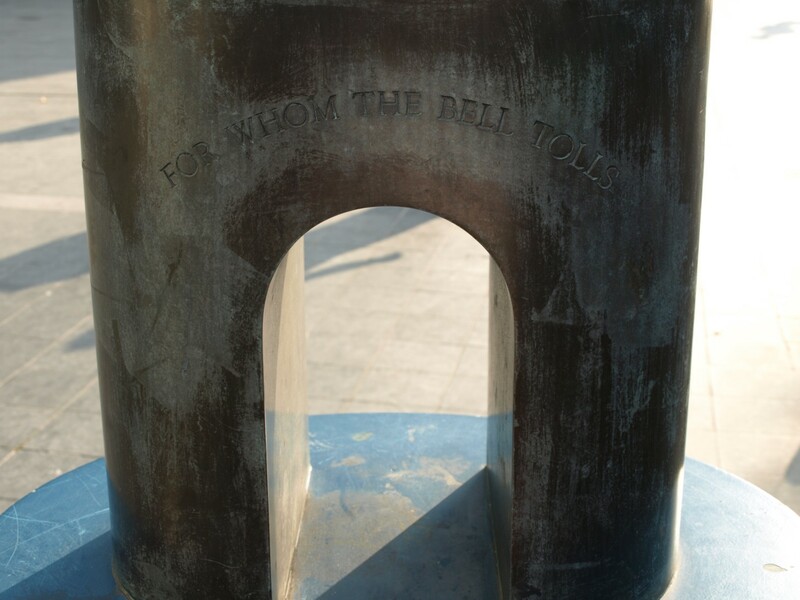 maybe even a tower of fate and death. 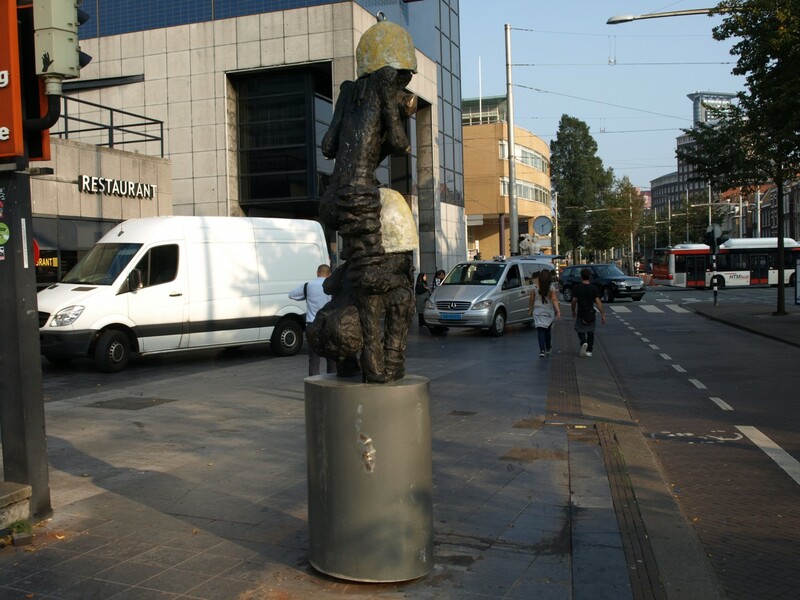 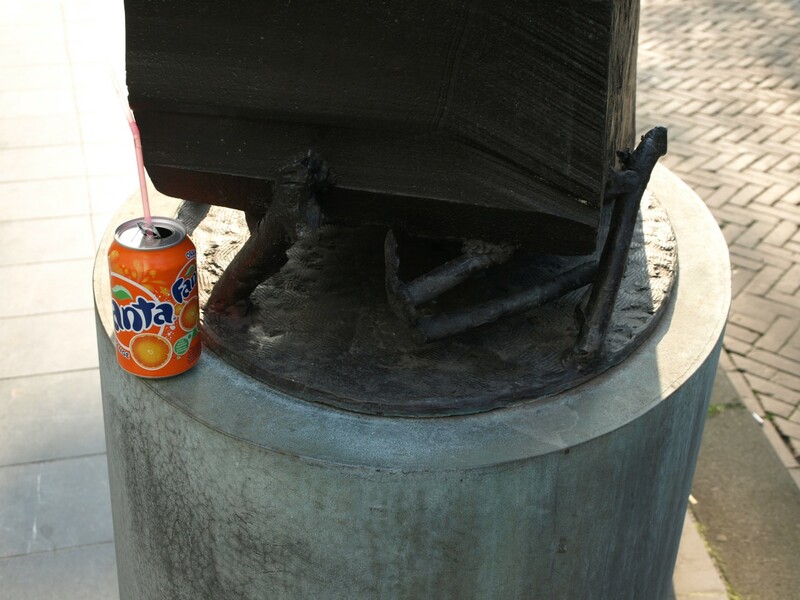 is used as a piece of street furniture, in this case a dustbin. 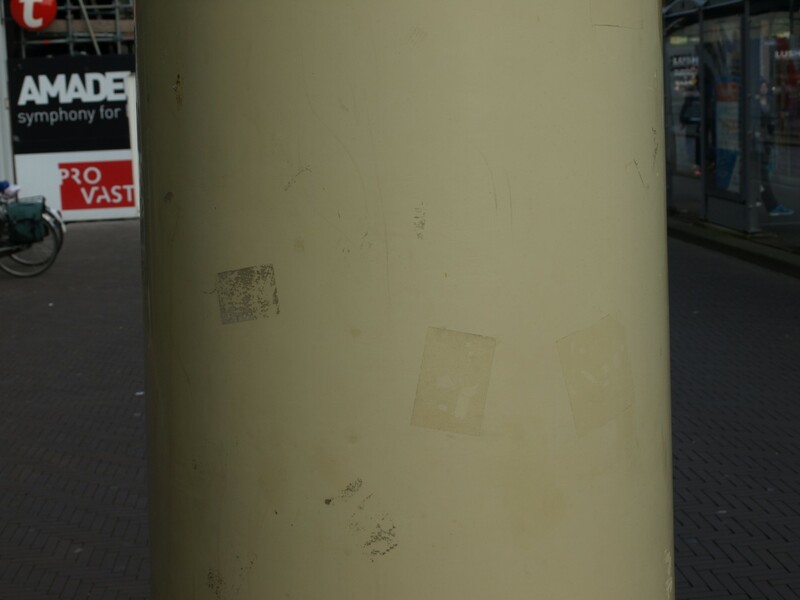 isn’t that clear enough just by that fact?. 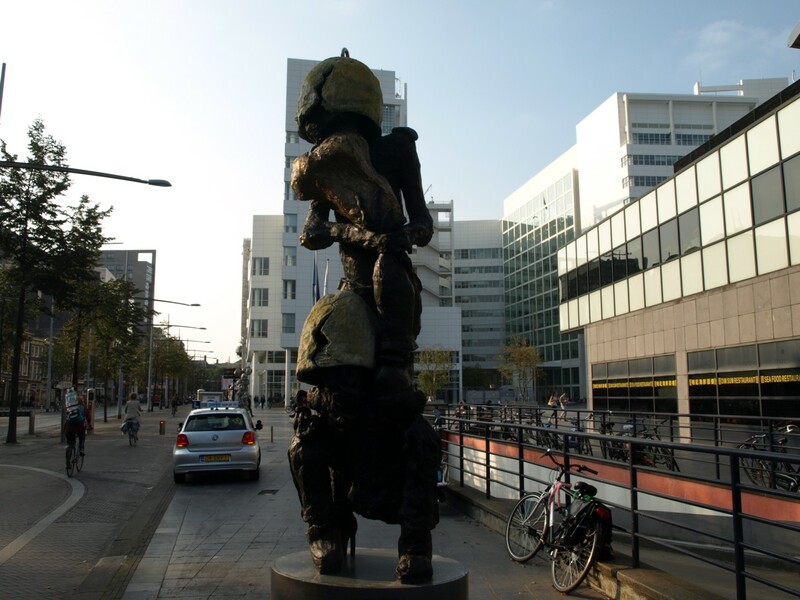 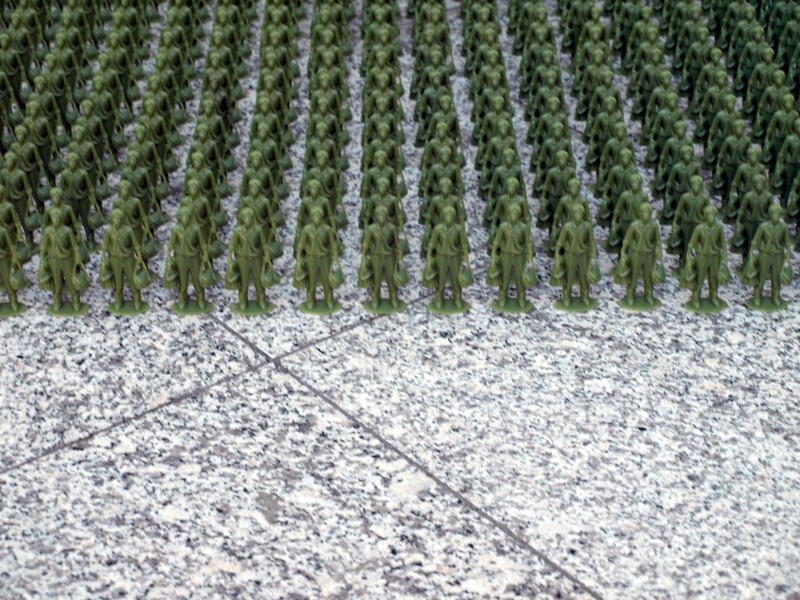 the sculptures of the Ministry of Defence stand guard from quite another position at the other side of Kalvermarkt. 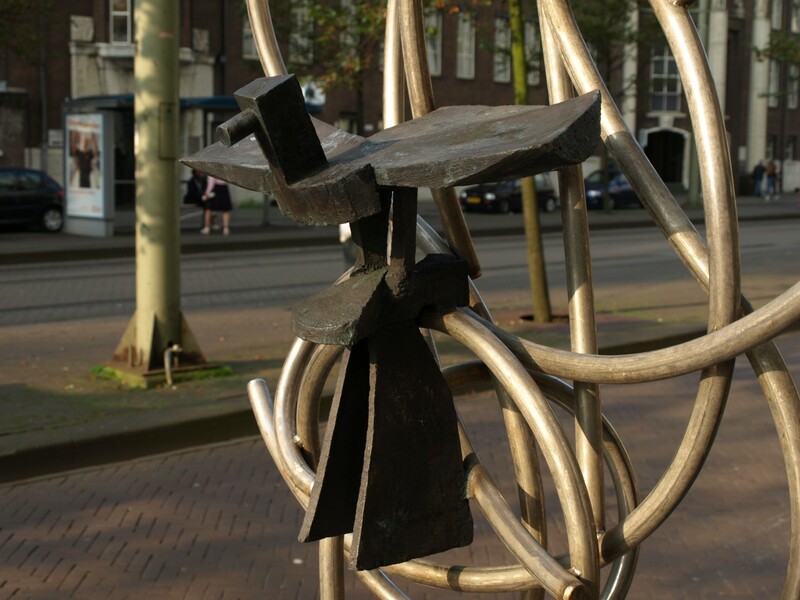 his usual aesthetics of finding harmony in unbalanced components. 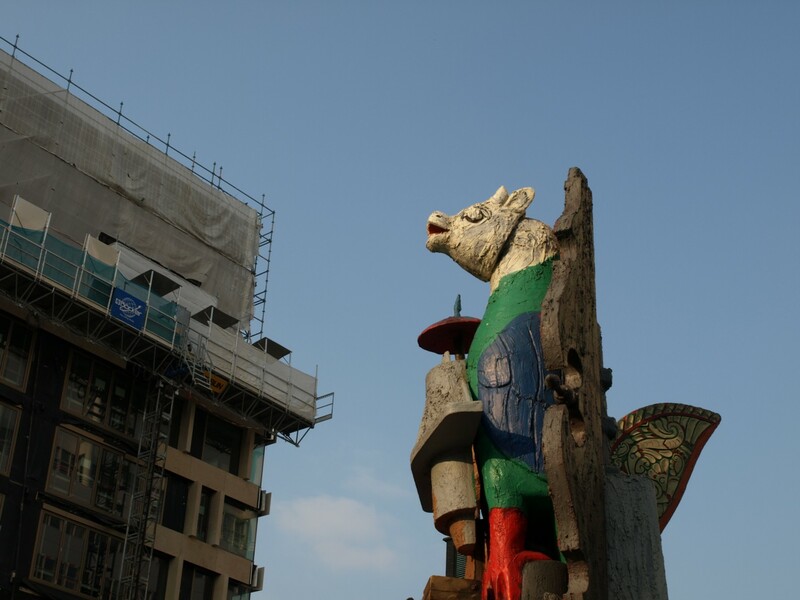 the sparrow hawk has come down. 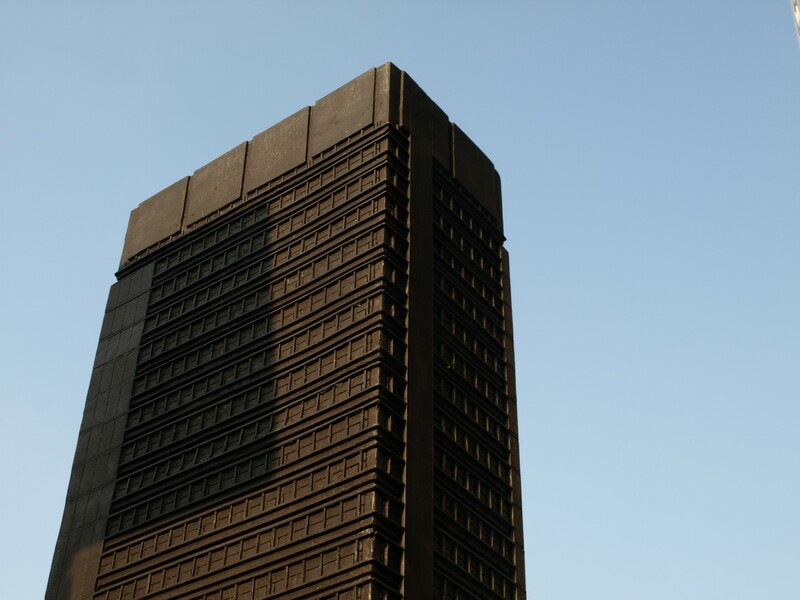 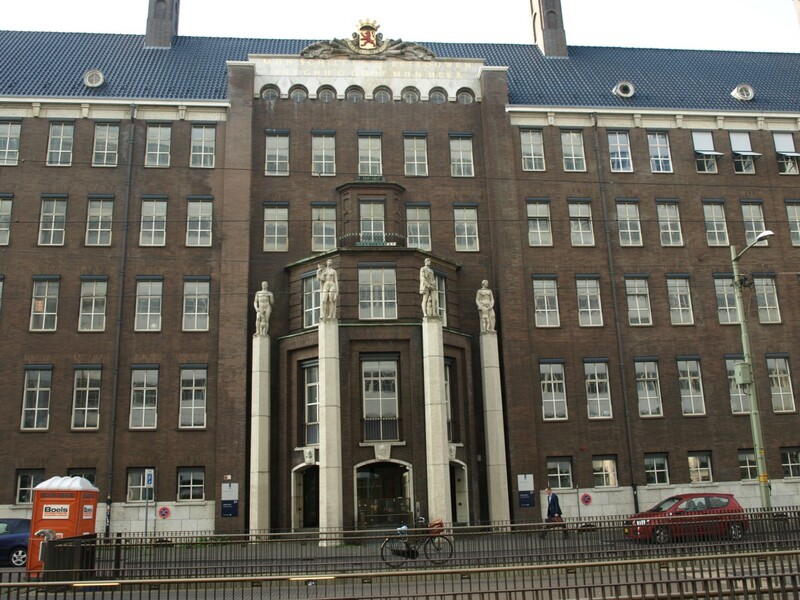 The massive and dark volume of Jan van de Pavert’s Ministerie (Ministry; 2000) referring to the former buildings of the Home Office and Ministry of Justice, may remind you of a modern version of Kafka’s Castle. 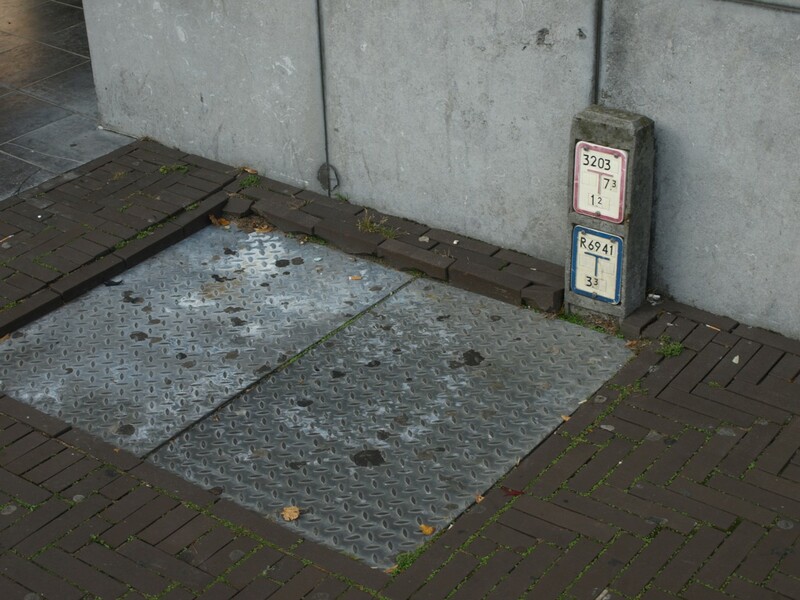 But what is it doing there next to a road sign? 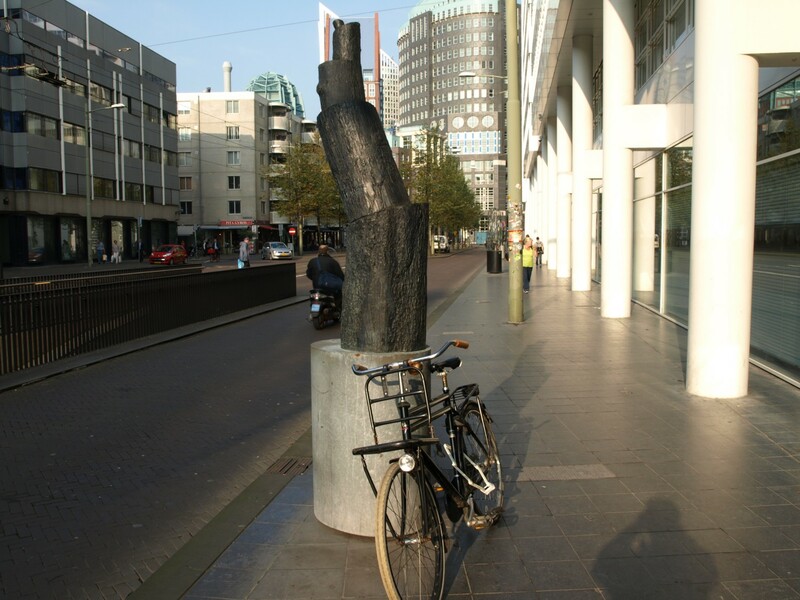 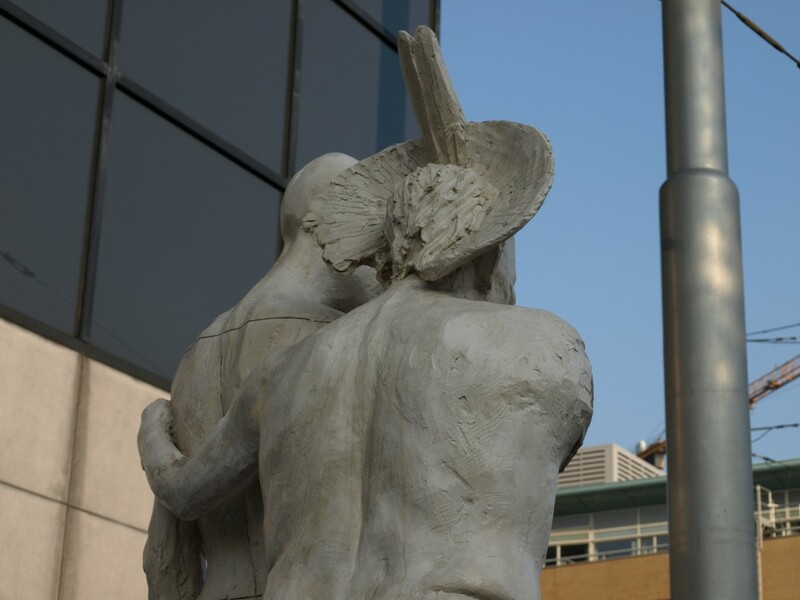 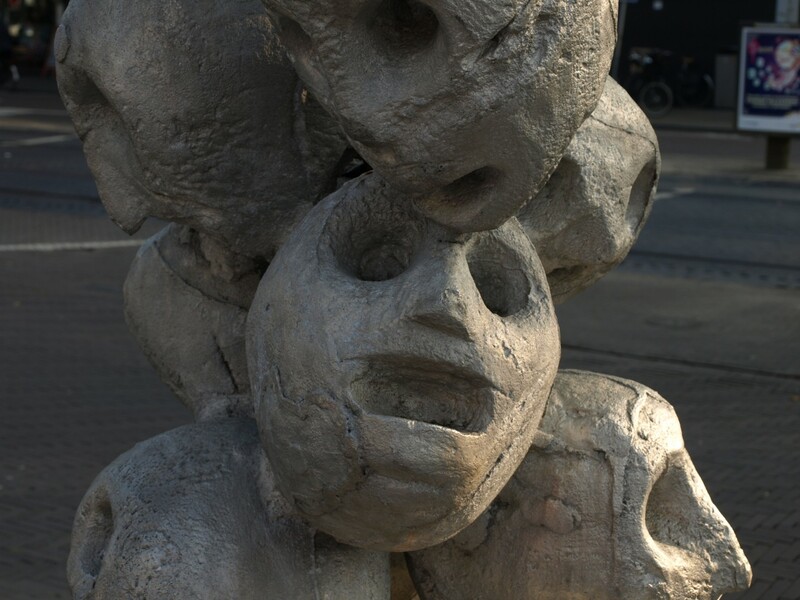 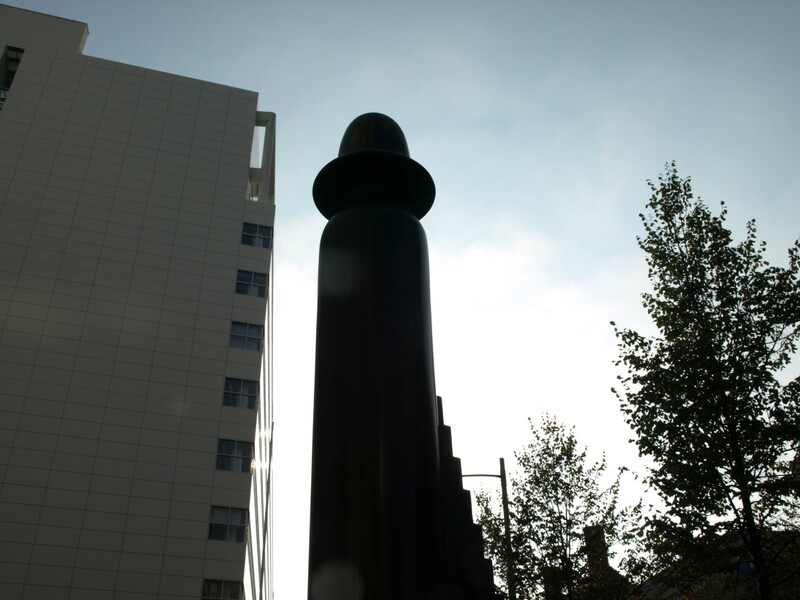 What has it to offer to the passers-by there and what kind of context has its environment on offer to add to the sculpture? 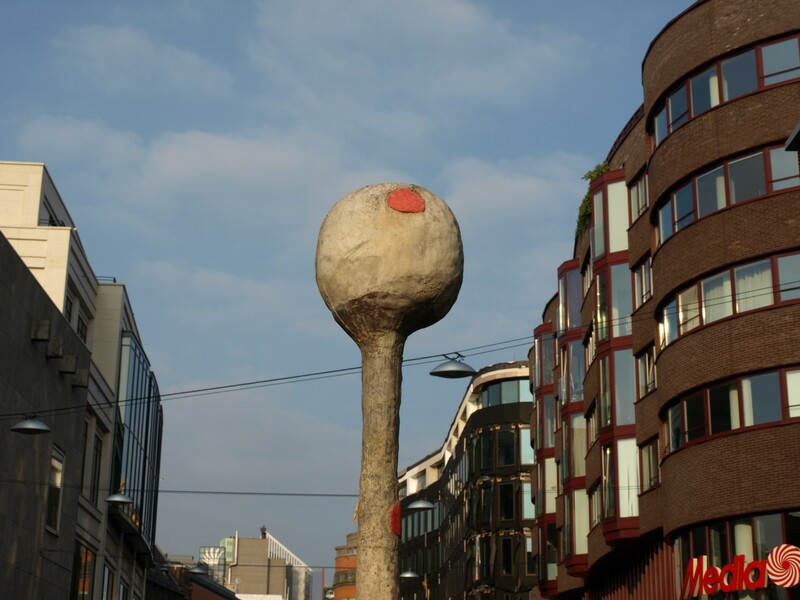 is Karel Appel’s Frog with Umbrella (1993/2001) which has been drawn into the project but which is much bigger than the rest and so breaks the monotony of the rest of the series. 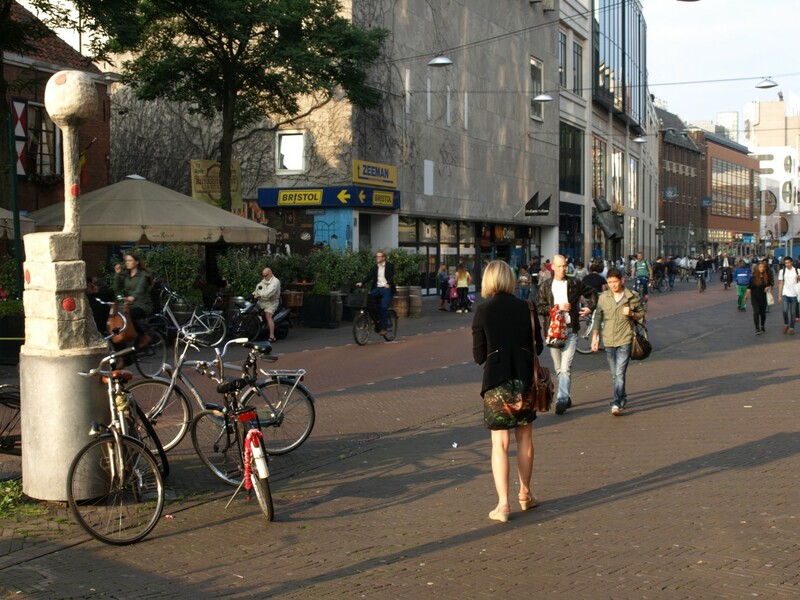 you may ask what two strolling people add to all the other strolling people in the street. 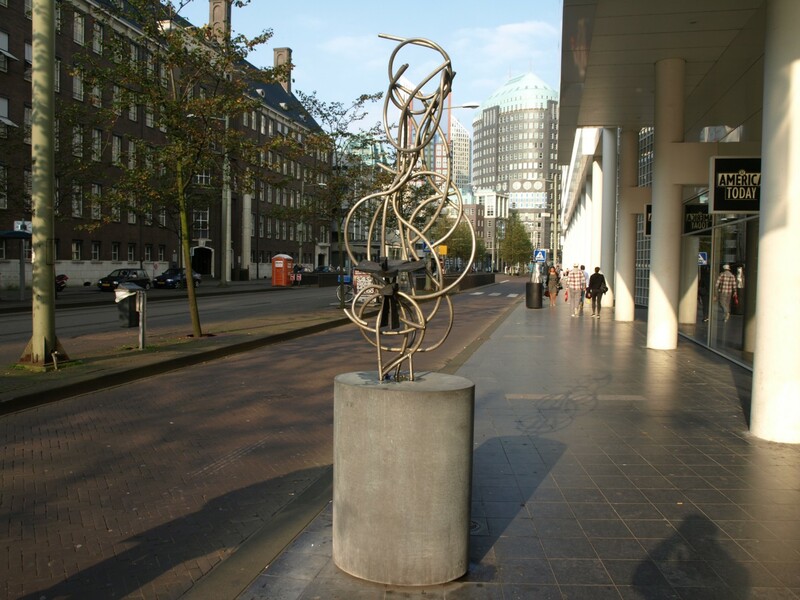 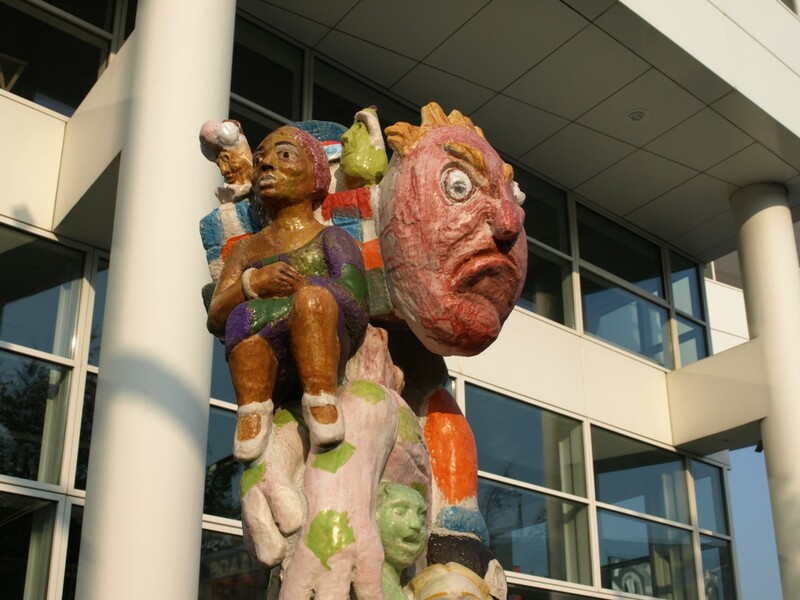 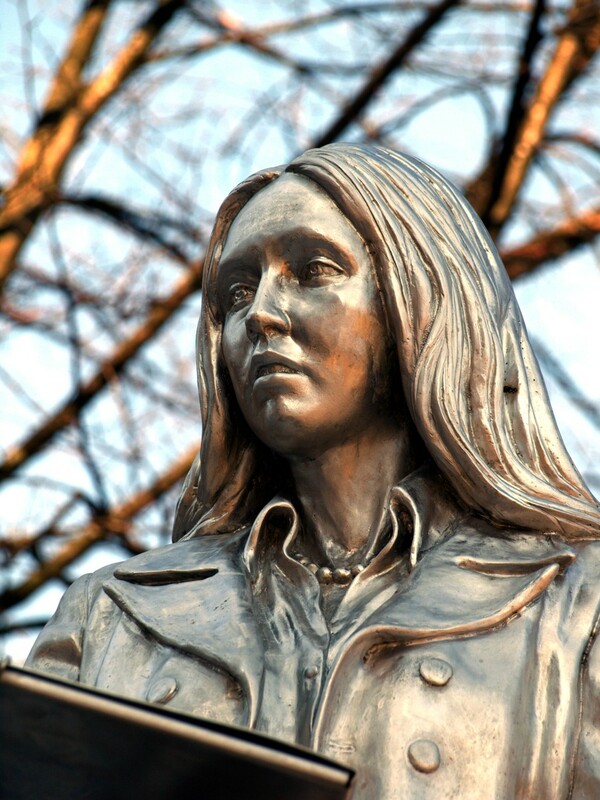 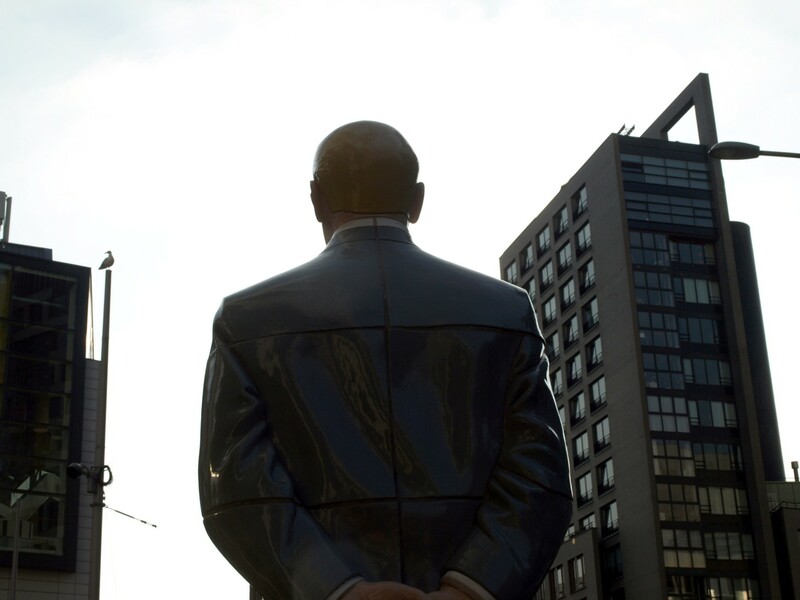 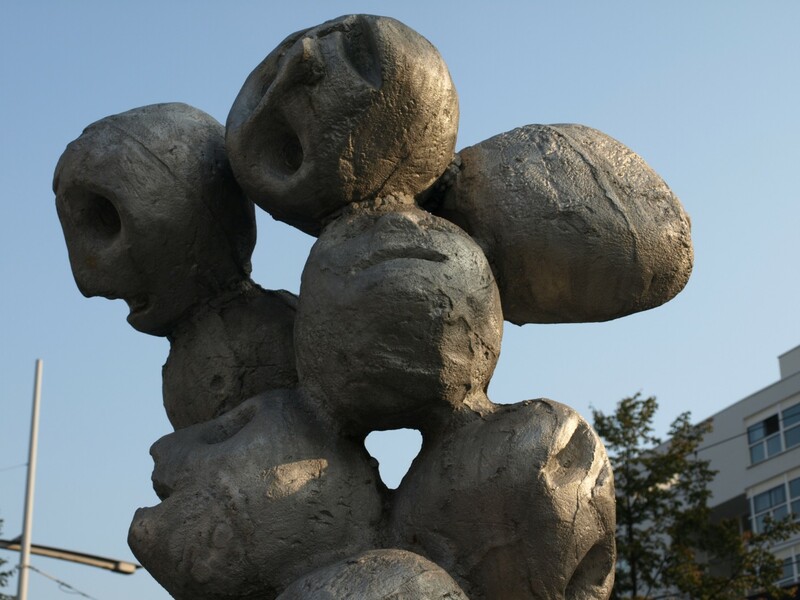 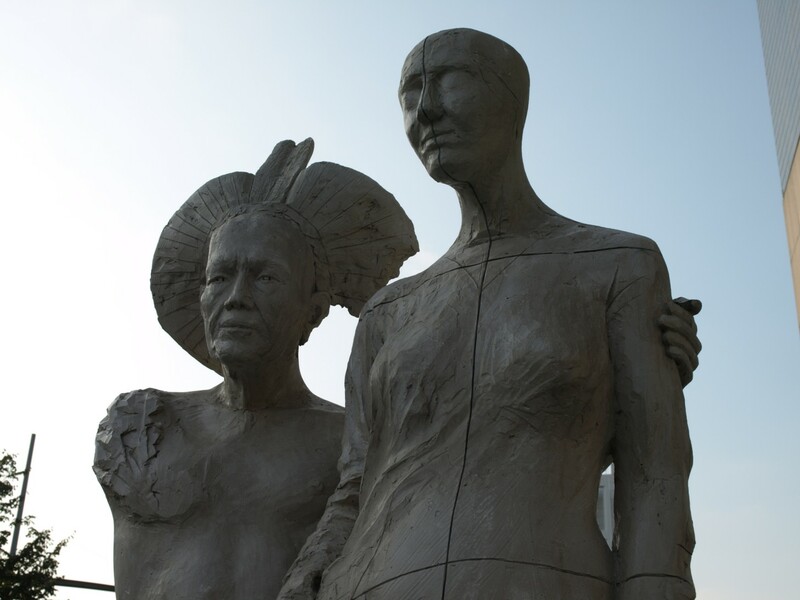 it is another example of the democratisation of public art. 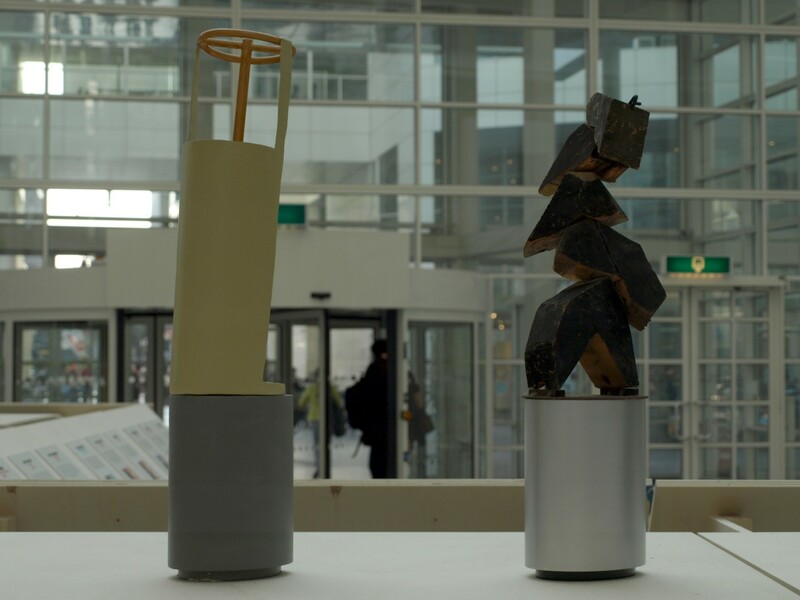 not to be obsolete, in spite of their substantive and varying artistic qualities. 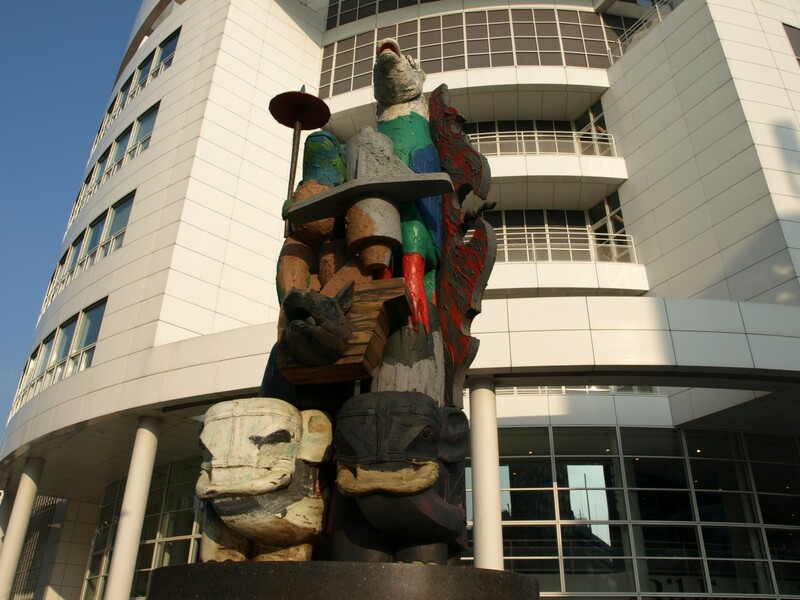 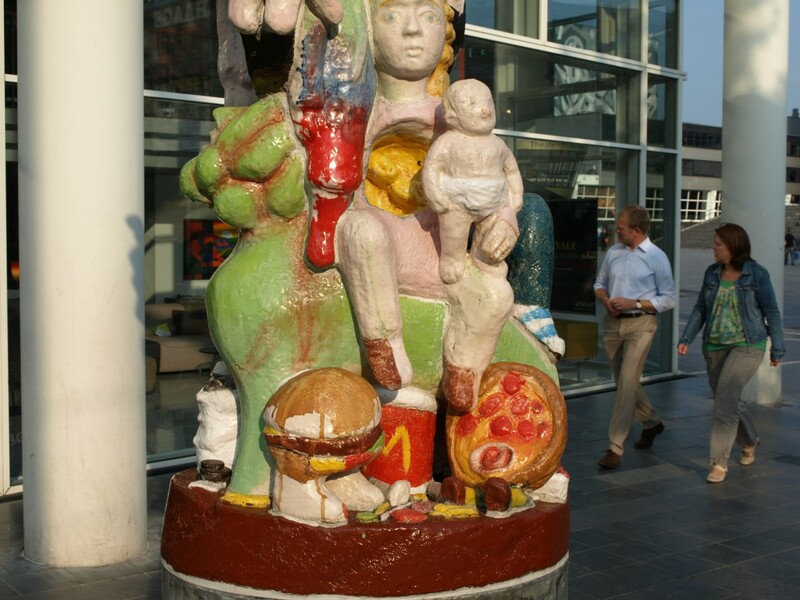 Back to Karel Appel, which shows you the advantages of a non-floating pedestal. 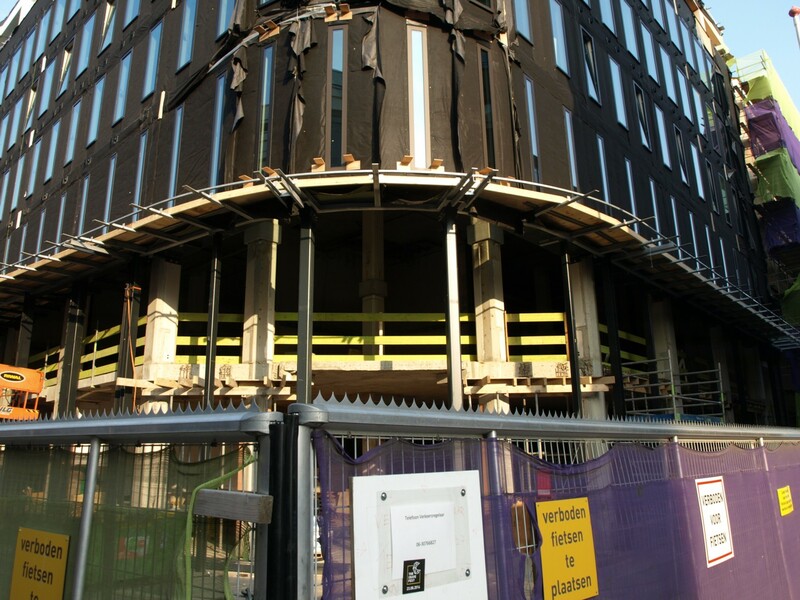 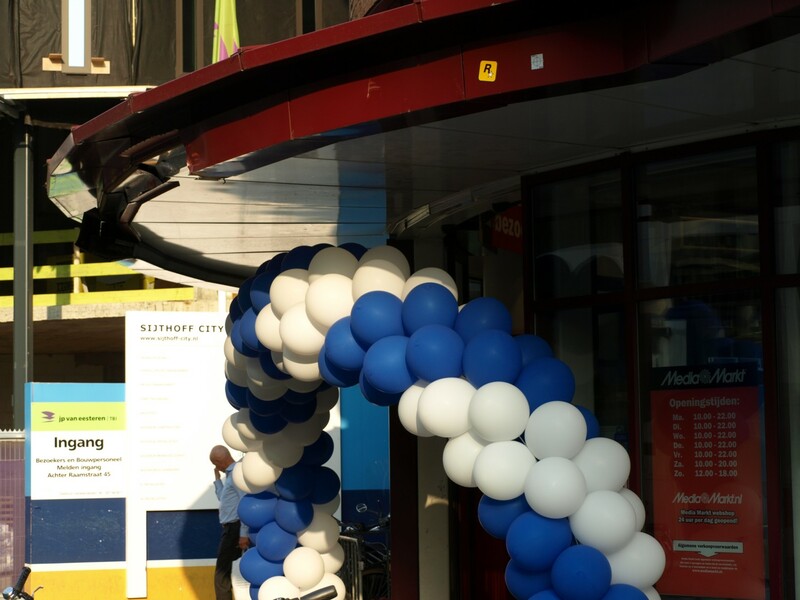 is still in limbo as the Amadeus building is not finished yet. 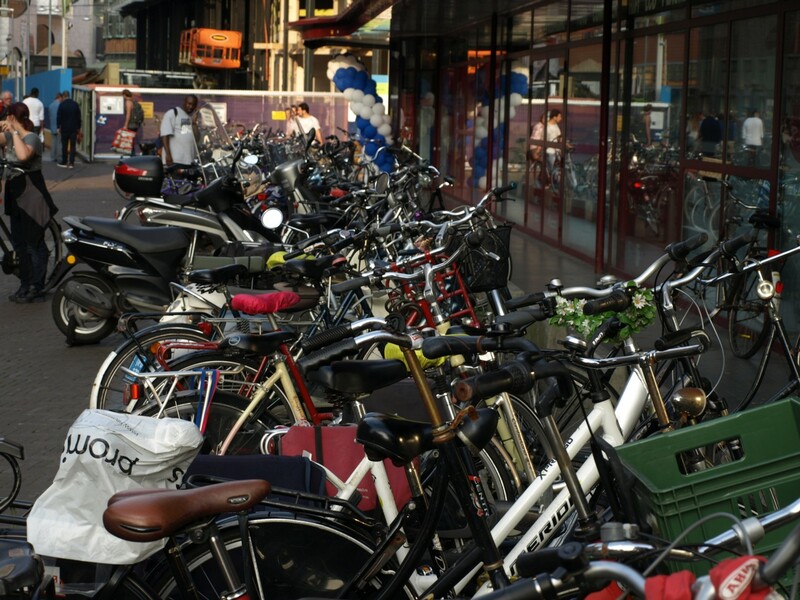 the ambiguous nature of its title underscored by its function as a parking spot for bikes. 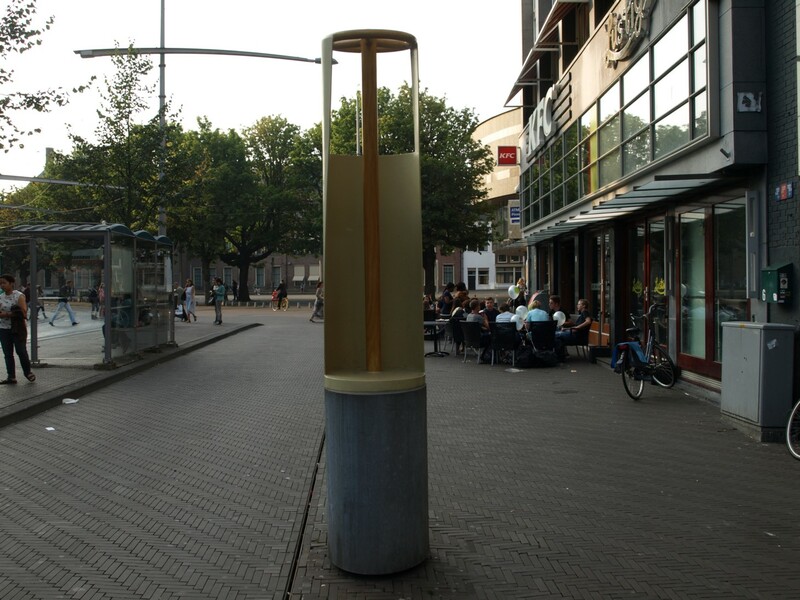 to stand there to show you how pieces of street furniture become street weeds, although as such they blossom well. 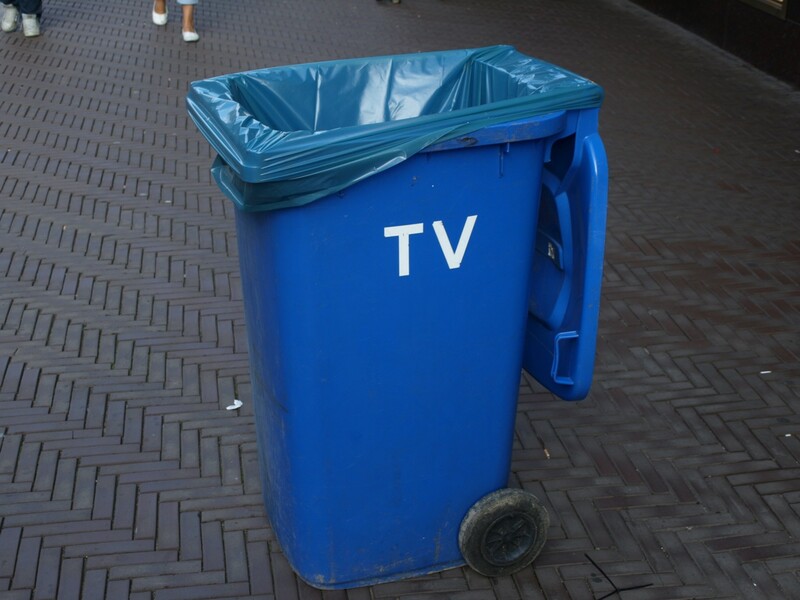 keeping up appearances, that’s what it is all about! 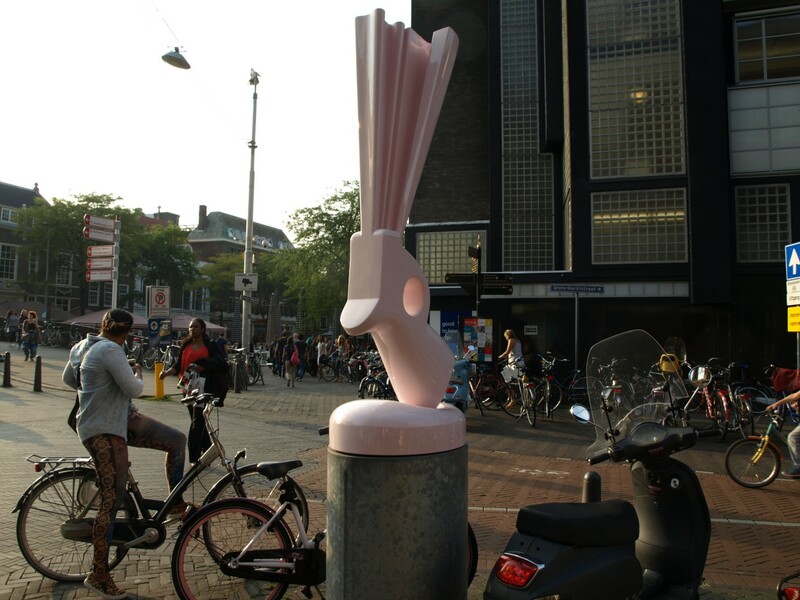 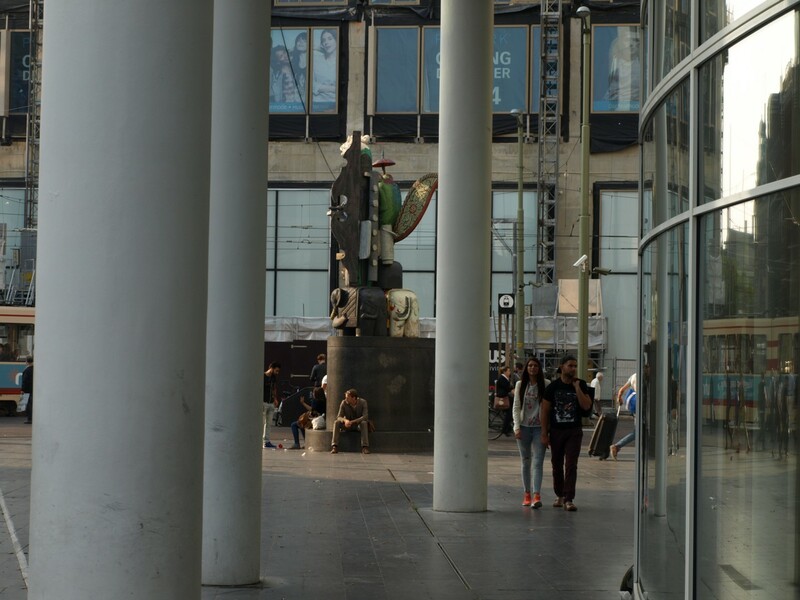 Artists who have done their best to make valuable things for public space are just being used to decorate the coop of the strutting peacock of international consumerism. 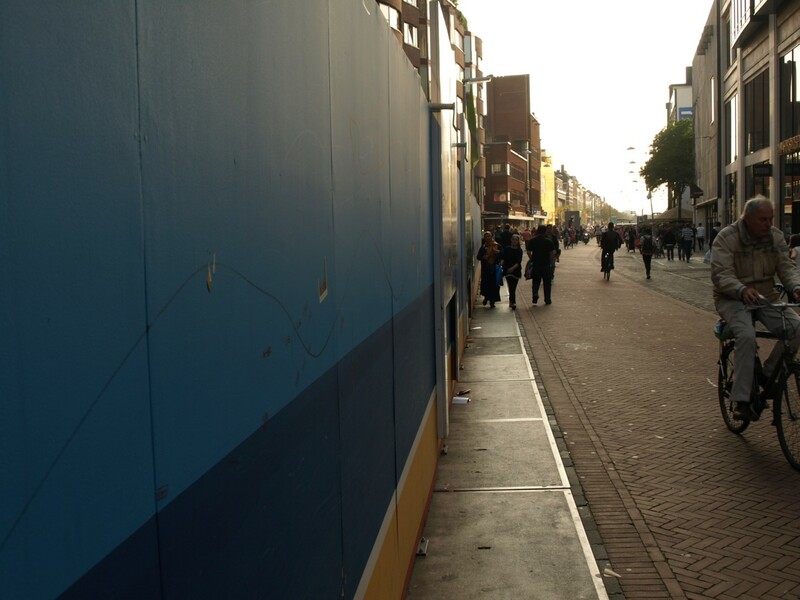 Artists, herewith your works have been declared empty! 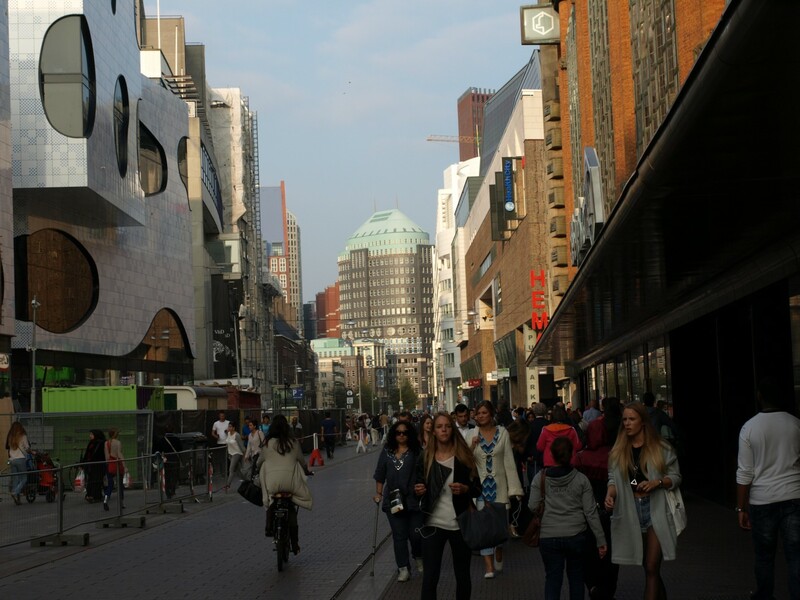 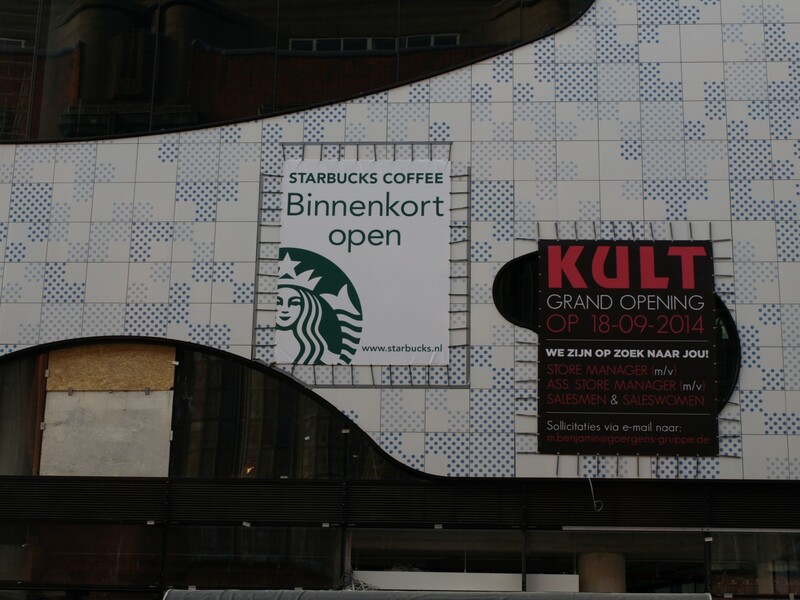 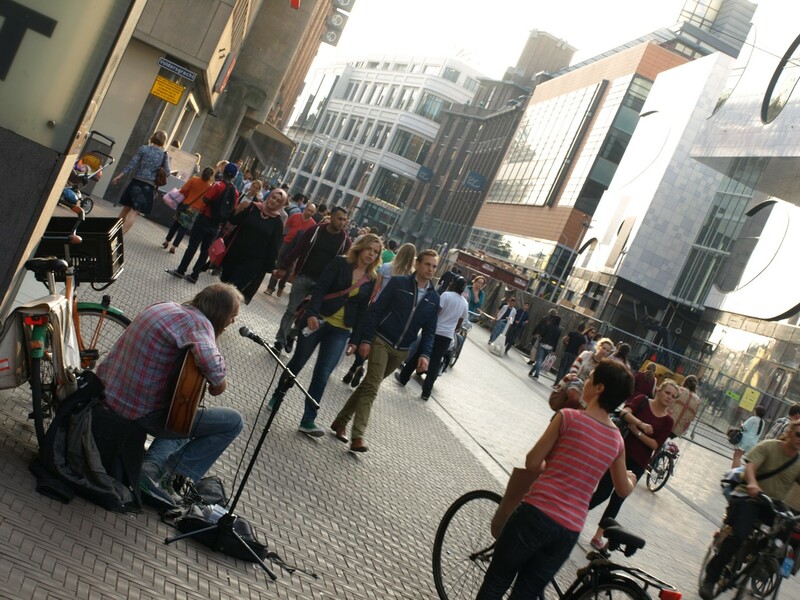 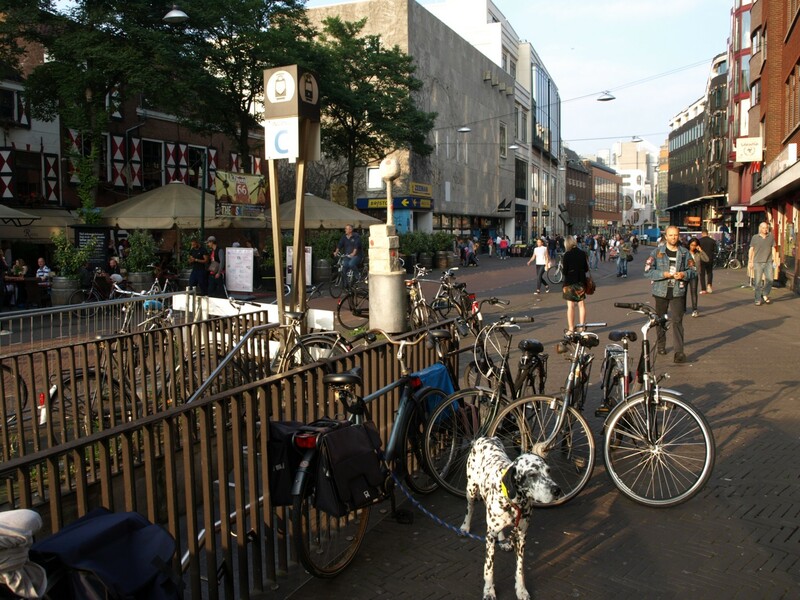 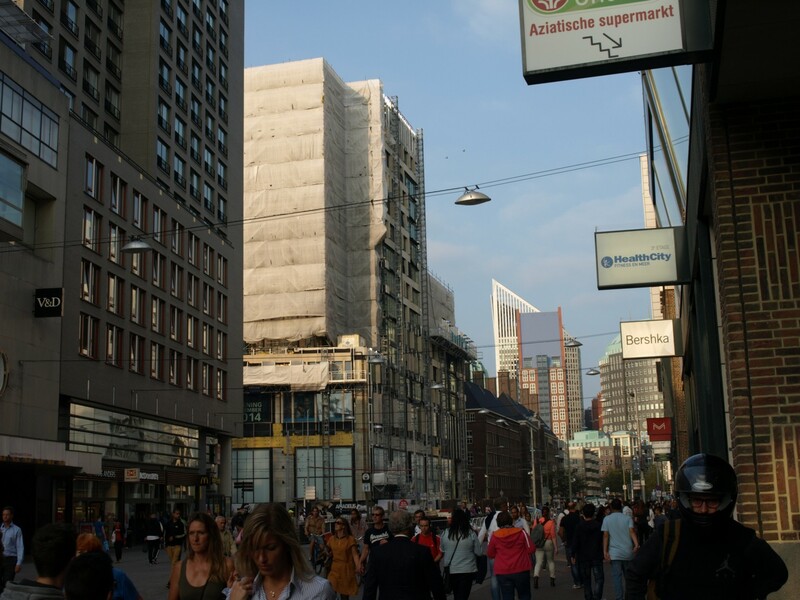 they will stand in the way of all these international people who will come all the way to The Hague’s Grote Marktstraat to drink a Starbucks and to spend, spend and spend. 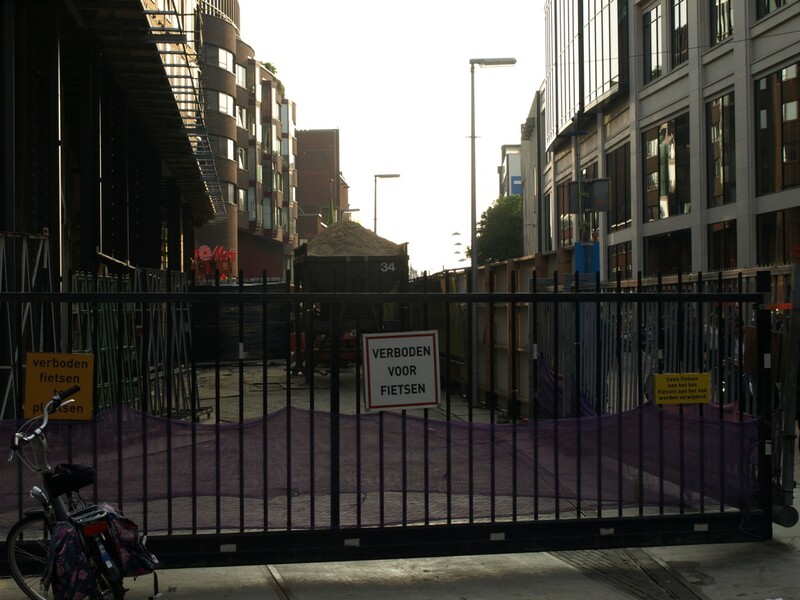 But of course dreams never come true.